Ah May Long weekend… What a lazy, sunny, wonderful start to summer. Justin and I spent most of the day on Saturday going to the market and lazing around in the backyard, and doing some gardening. I also decided it was high time to make some homemade ice cream. I’ve always wanted to make homemade ice cream, but I don’t have an ice cream maker. So, I improvised and found a recipe online that gives you instructions if you don’t have an ice cream maker. It was quite a lot of work, but it turned out pretty tasty. I also ended up making mine organic, without even meaning to! Awesome! 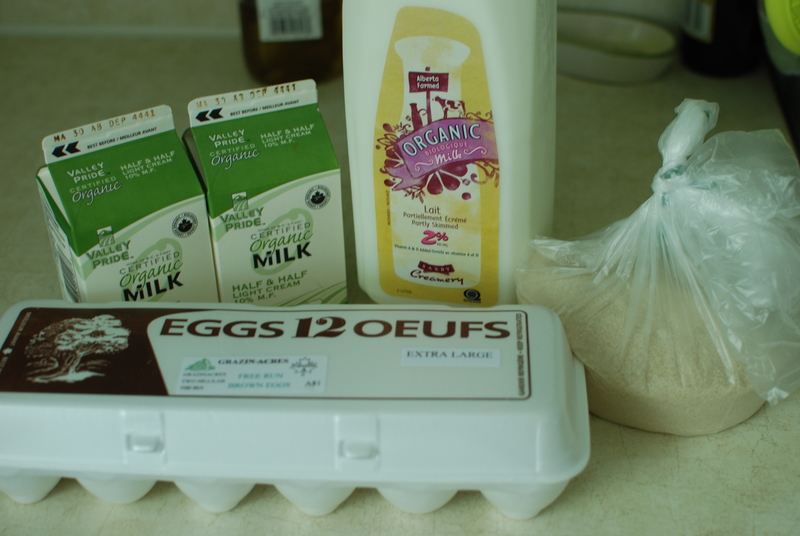 The ingredients to homemade ice cream are pretty simple. Milk, sugar, egg yolks, and cream. Vanilla too, of course. I ended up using a Groupon I had to the Earth’s General Store to pick up the all local, organic and fair trade ingredients for my Ice Cream. Loved it! 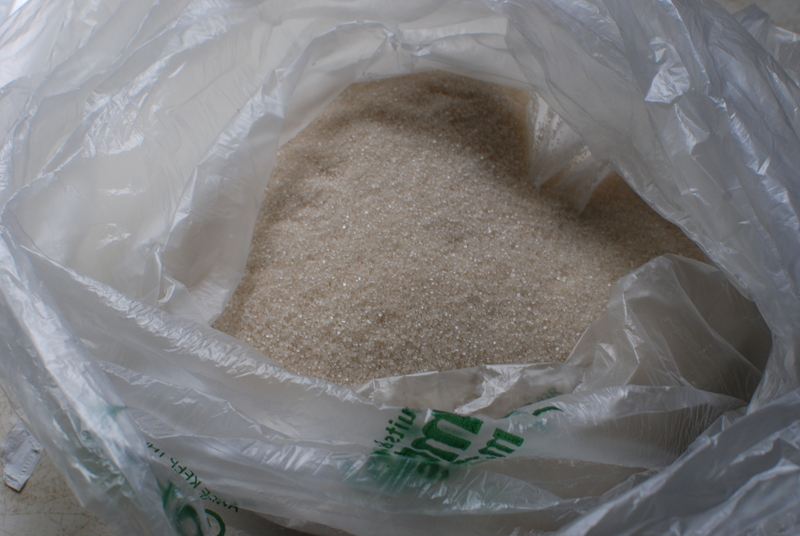 This was the sugar we used. 100% fair trade organic raw sugar. Now that is tasty, ethical sugar! 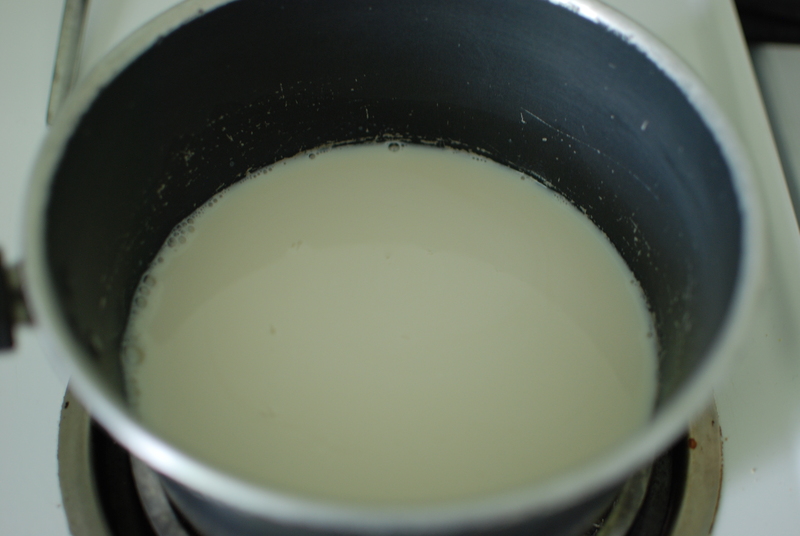 The first step was to cook the milk and sugar together until it dissolved. 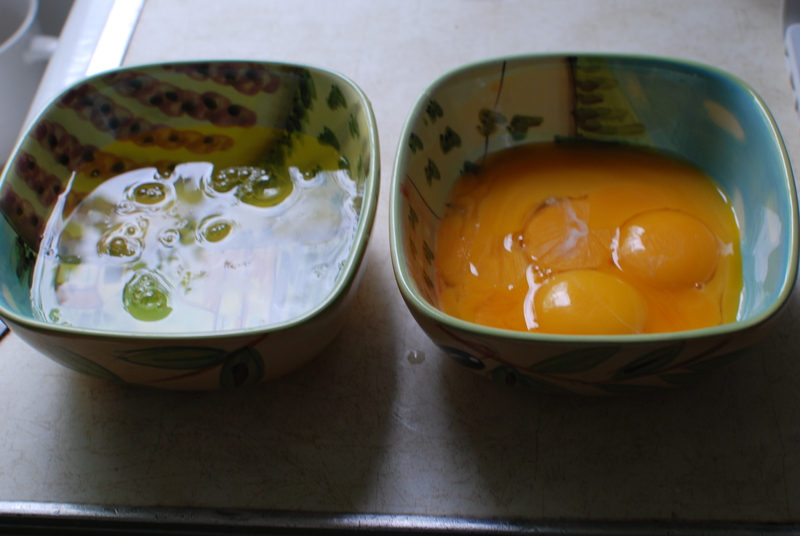 While I was waiting, I separated 6 eggs (because I had doubled the recipe). 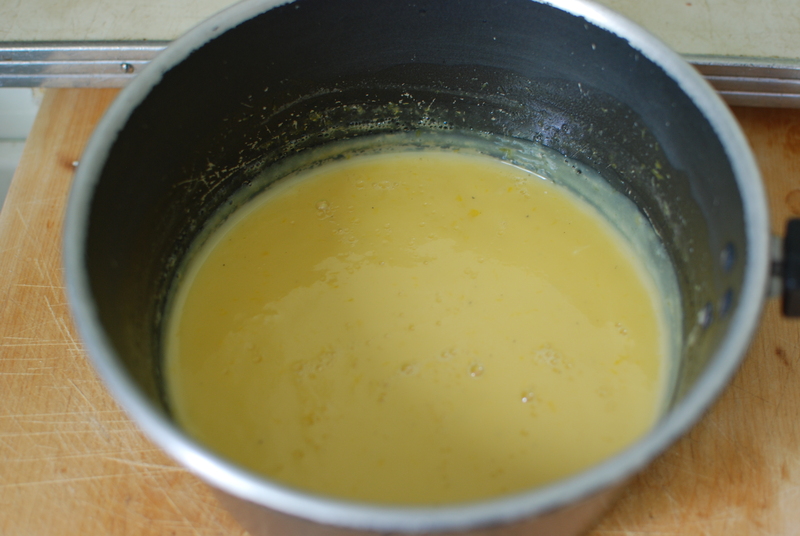 I took he milk off the heat and added the yolks, whisking until fully incorporated. 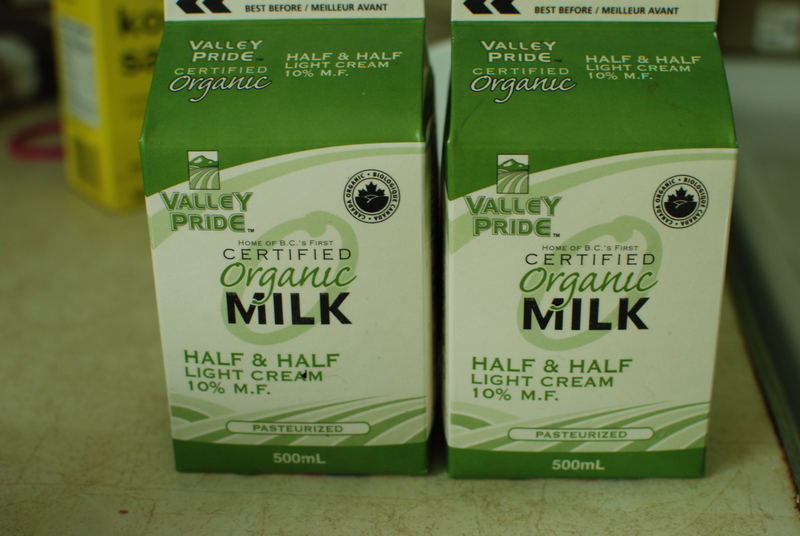 Next, I added the organic half and half. and whipped the mixture up in the hand blender for about 3 minutes. (I covered it with a cloth because it was splattering everywhere!) – Now here was the hard part: Every half hour, for the next 3 hours, I had to take it out of the freezer and repeat the whipping process. It would have worked out well enough had I remembered that I had doubled the recipe, and thus probably should have doubled the whipping time, which I did not. That’s probably why I ended up with a milkshake-esque bowl of ice cream. It tasted pretty good, but didn’t quite have that smooth tasty texture that ice cream normally does. Oh well! Trial and error I guess! In a pot on medium flame, combine the milk, sugar and salt. 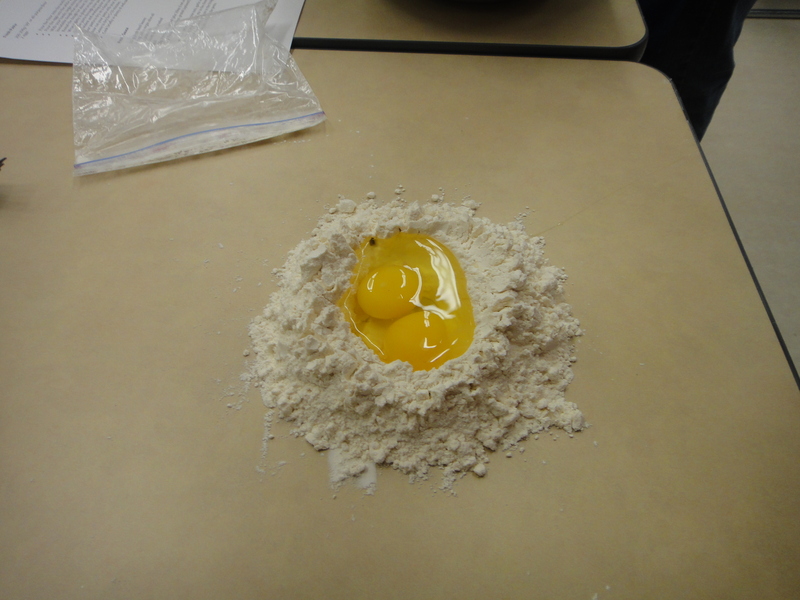 Once the sugar and salt have dissolved completely, add the egg yolk and stir continuously for 3-5 minutes. Take the mixture off the heat and let it cool to room temperature. Once cooled, add the vanilla extract and the cream or half and half. Stir well and place in the refrigerator for a few hours (an hour at the very least). 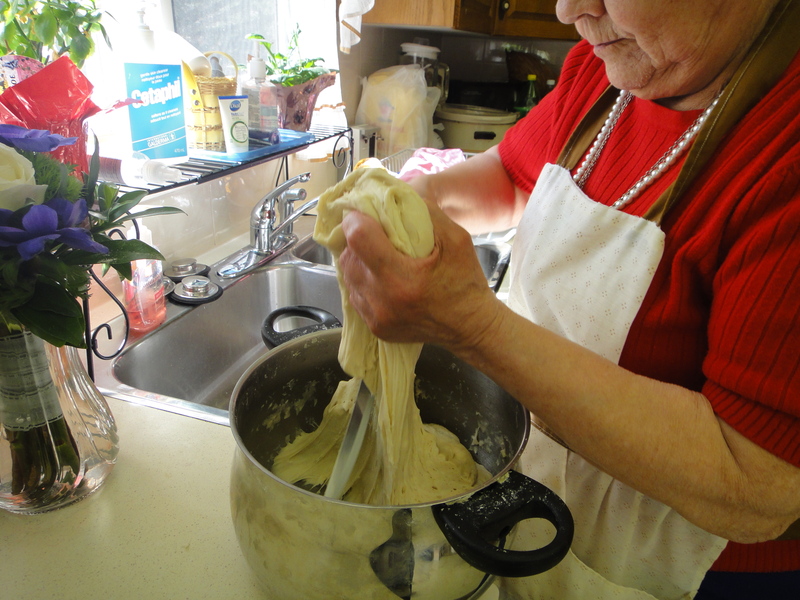 Take the mixture out of the refrigerator and whip well with a whisk or a handheld mixer. Place it in the freezer. 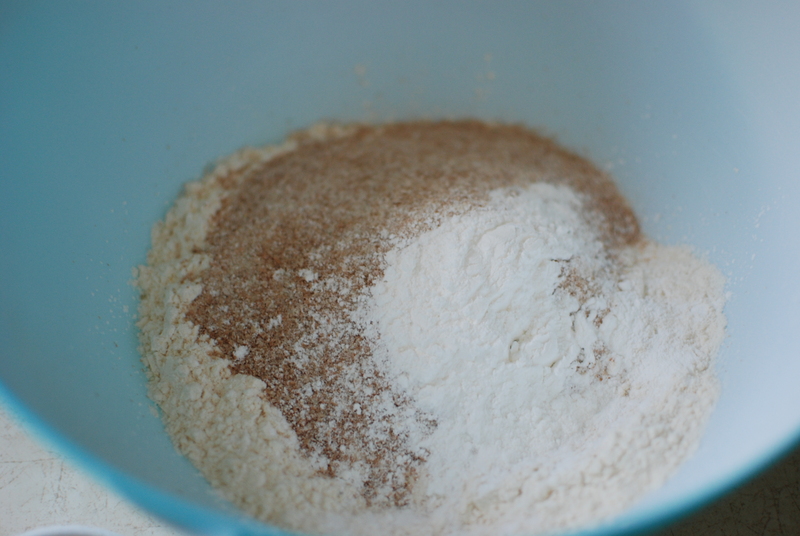 Every 30 minutes for the next 2 – 3 hours take the mixture out of the freezer and repeat the whipping process. This is to prevent the ice crystals from forming. 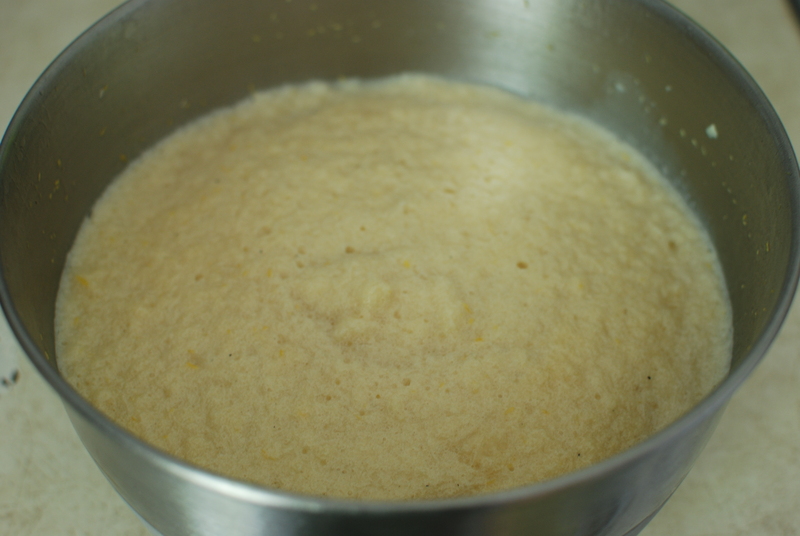 Let the mixture stay in the freezer for about 2 hours after the whipping process is over. The ice cream is ready to serve and best if eaten fresh. * If doubling the recipe, like I did, make sure to double the whipping/freezing time. 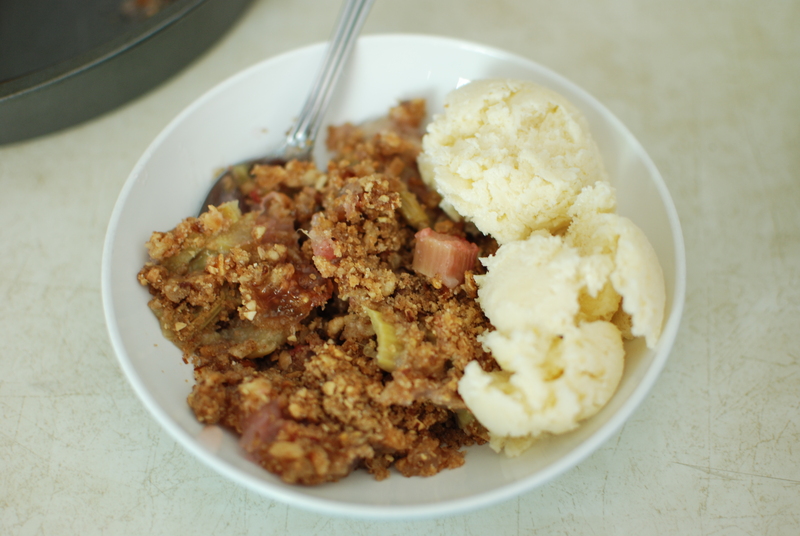 The second part of this post is devoted to rhubarb. 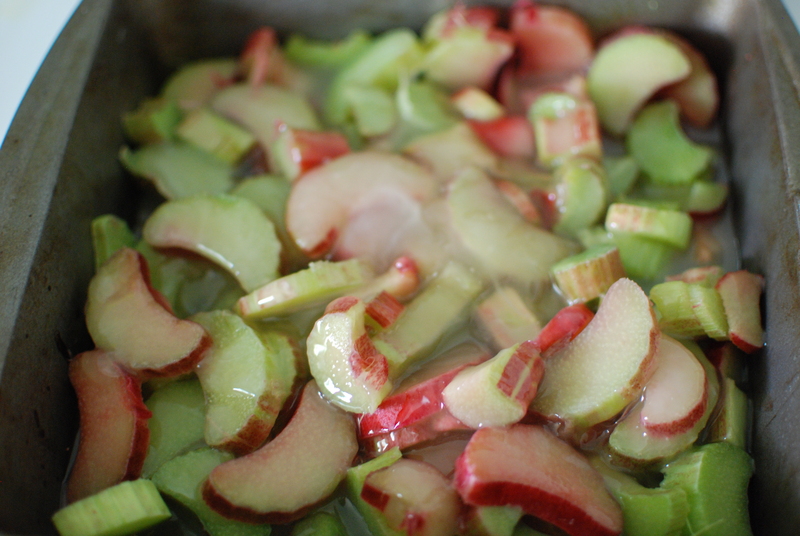 I never really knew how awesome rhubarb was until I began cooking with it (which began his weekend!). To me, rhubarb looked a lot like big, pink celery, and had the same consistency and texture to it. 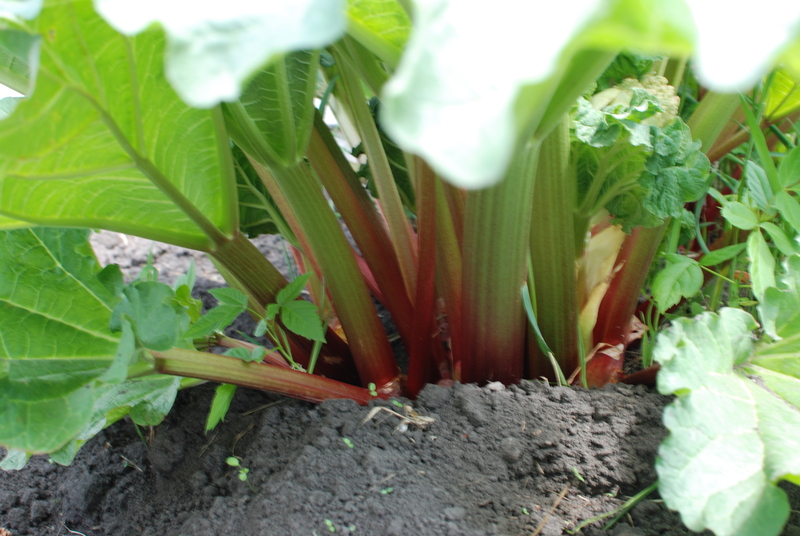 putting it into a desert didn’t really appeal to me, until I realized that I had a massive bush of rhubarb growing in my garden, and it was threatening to take it over. I didn’t really have a choice. 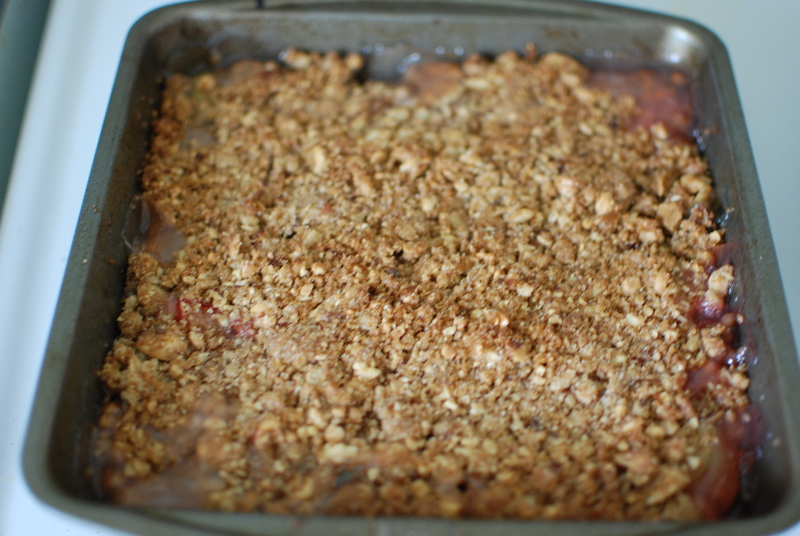 Rhubarb crisp it was! 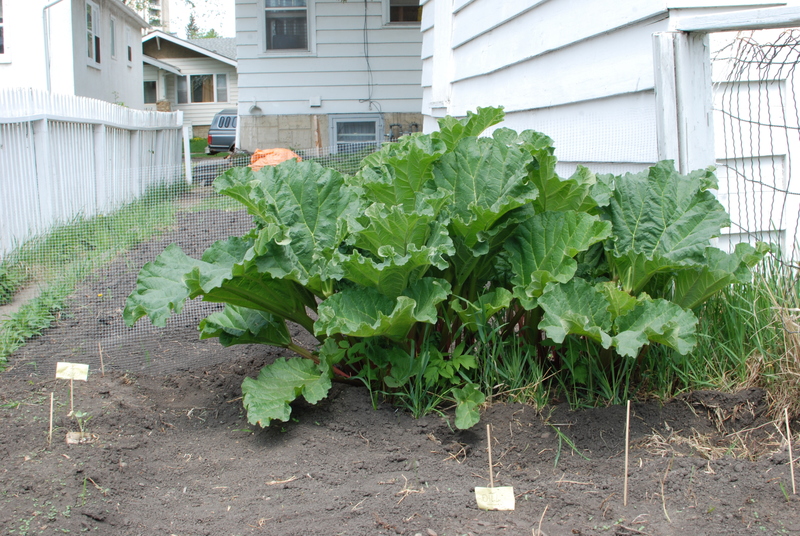 There’s the crazy rhubarb plant, taking up a huge chunk of the garden! I chopped down a few stalks for the crisp. 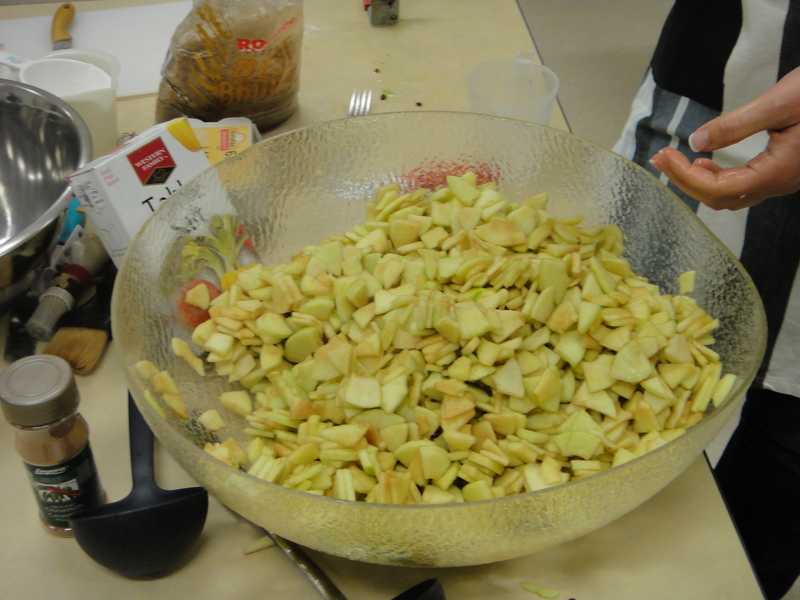 I cut the stalks up into small pieces, and made a base using sugar, water and cornstarch. Yummers! The crisp was really easy to make too. Granola, flour, brown sugar and butter. Yum! Here’s the before baking picture. And here’s the after… All gooey and crispy. 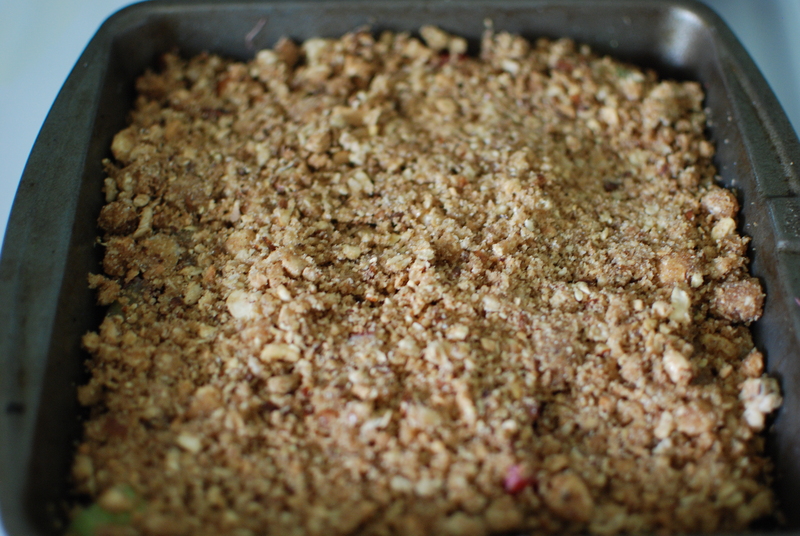 All in all, I’m very happy that I finally tried cooking with rhubarb. That weird looking pink celery turned out to be delicious when baked with sugar! 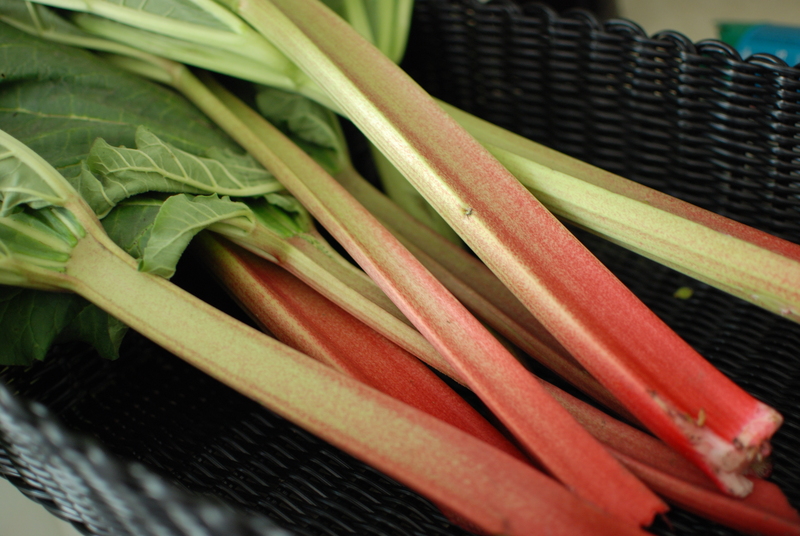 If you have a rhubarb plant threatening to invade, you should chop it down and turn it into a crisp. You wont regret it! What a great time the family has been having lately, with all of the wedding festivities, and the return of summer like weather. 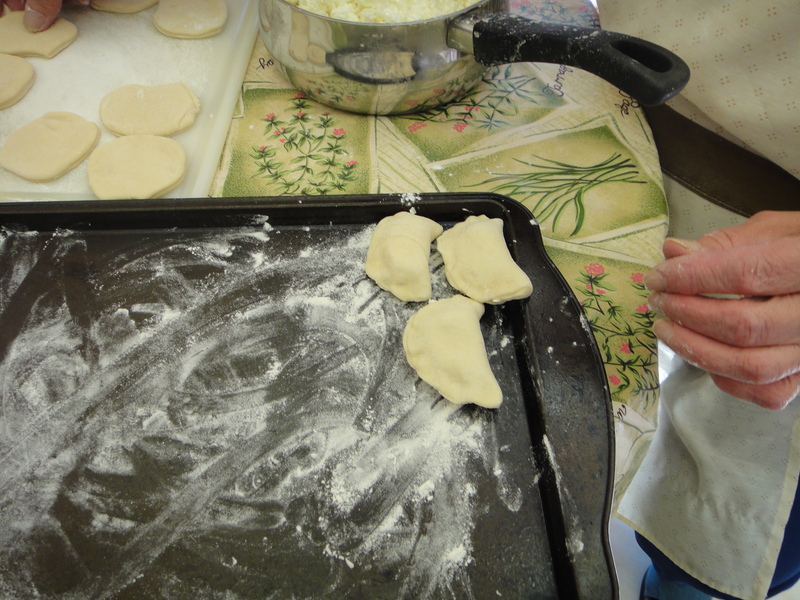 My Baba stayed an extra day after the wedding to make a few batched of perogies with us. We were so lucky to be able to get her secret recipe, and boy, was it ever a treat! My sisters and I have been enjoying these perogies since we were little kids, and we never tire of them. They were always highly anticipated family meals, when prepared, and they still are today! 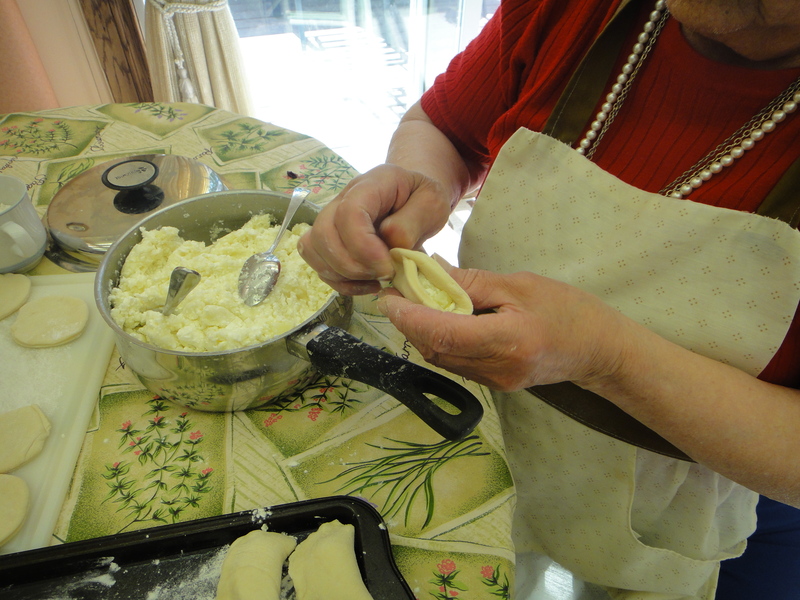 Baba uses dry cottage cheese and minced potato in hers perogies. Very simple, but ridiculously delicious. 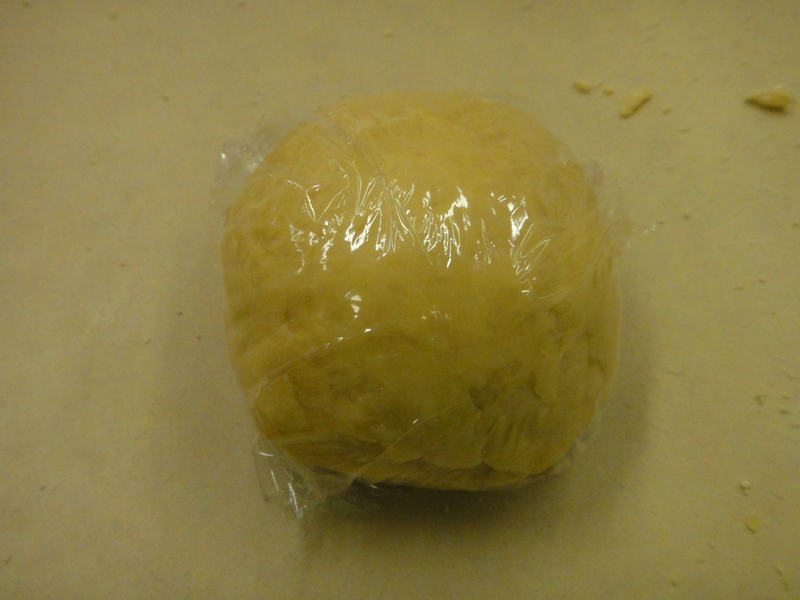 The dough was so stringy and sticky that we had to cut off big chunks with a knife before rolling it out. 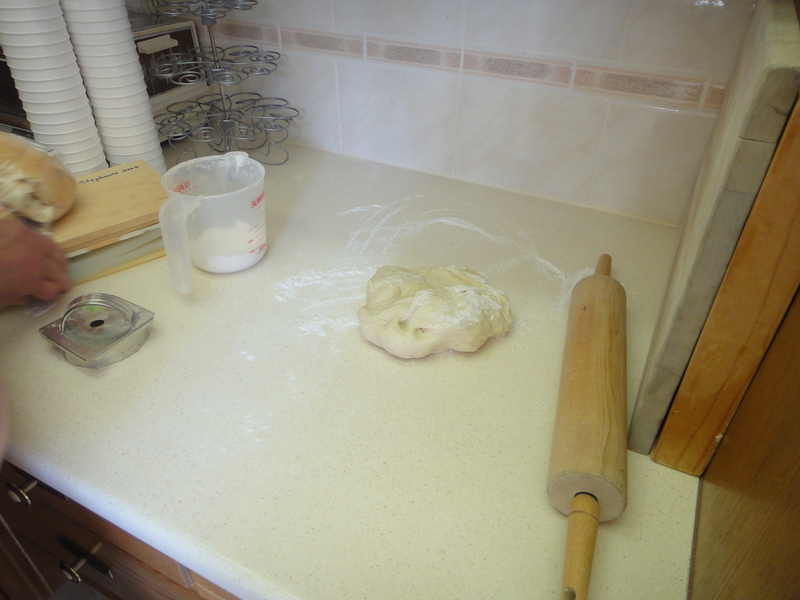 This was my work station, where I was the dough roller and cutter. 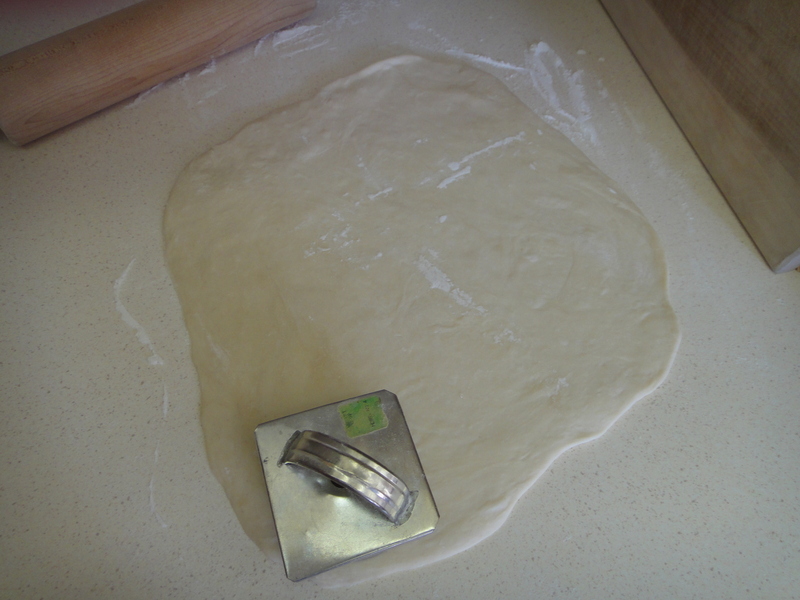 It took a while (and some fancy rolling pin action) to get the dough to roll out smooth, because it kept springing back at me. There’s my little perogy cut out! 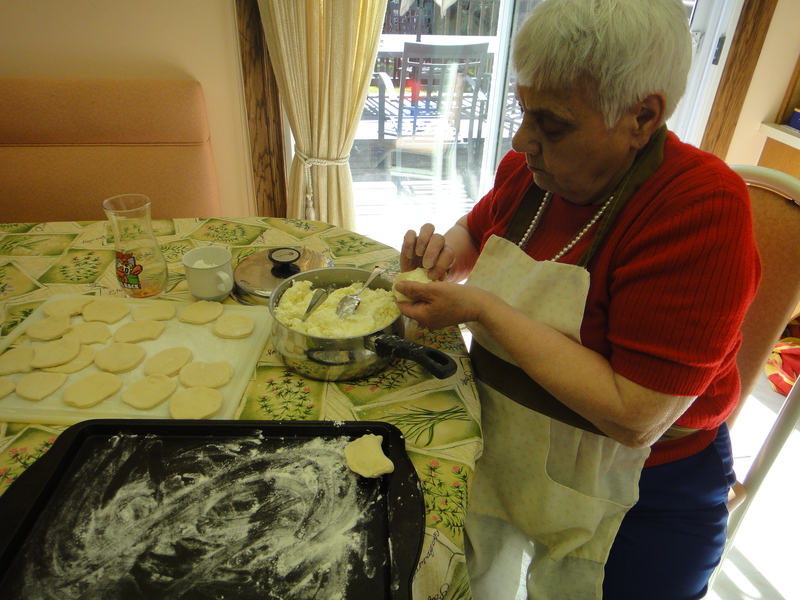 Here’s my Baba expertly stuffing and pinching the perogies into their ideal-sized pockets. 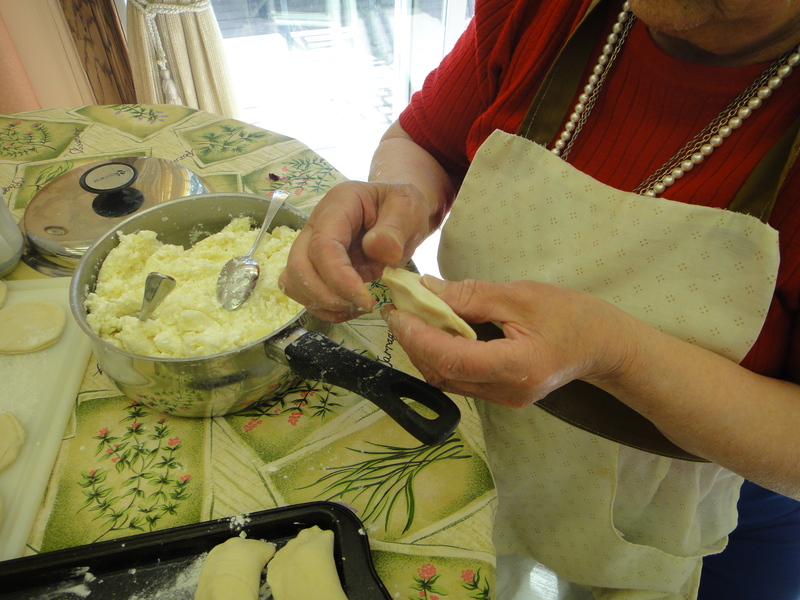 She used about a half a tablespoon in each perogy, so not to over-stuff them. 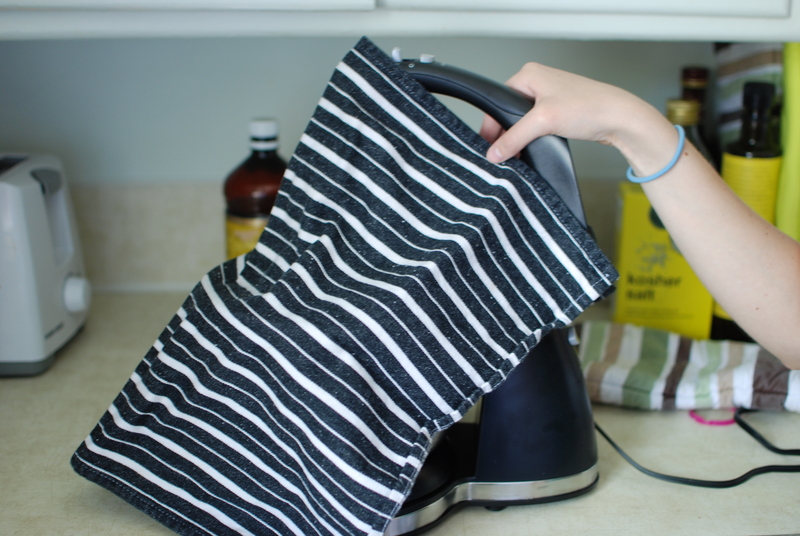 making sure to pay extra attention to the ends, as they tend to come apart in the water while boiling. 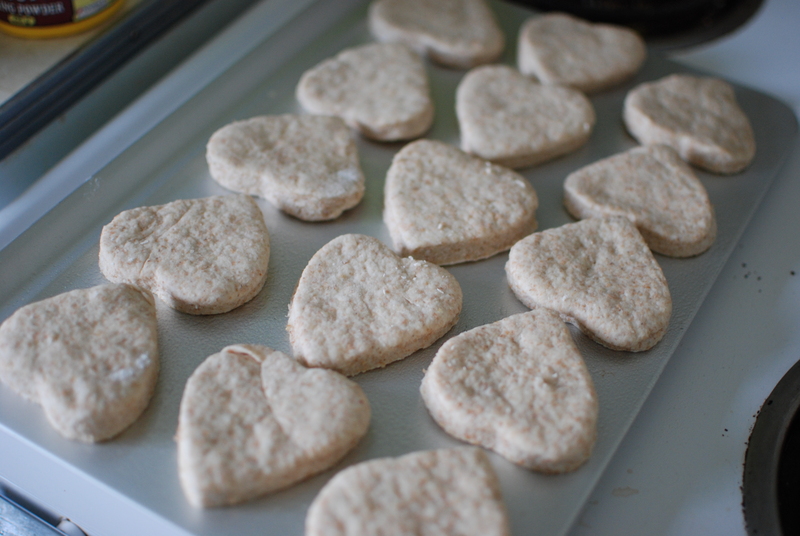 We put them on cookie trays, sprinkled with a bit of flour, and froze them like this. That way, they do not clump together in the freezer, and stay together better while they are boiling. Oh yes, there is a method to our madness! 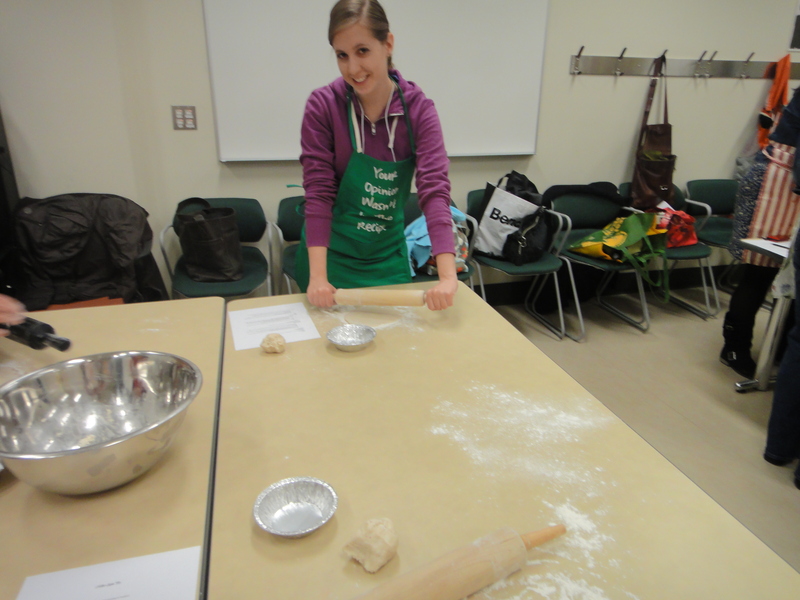 Here I am, rolling out more dough, while the others pinched away! And soon, we had LOADS of perogies, to last us quite a while! 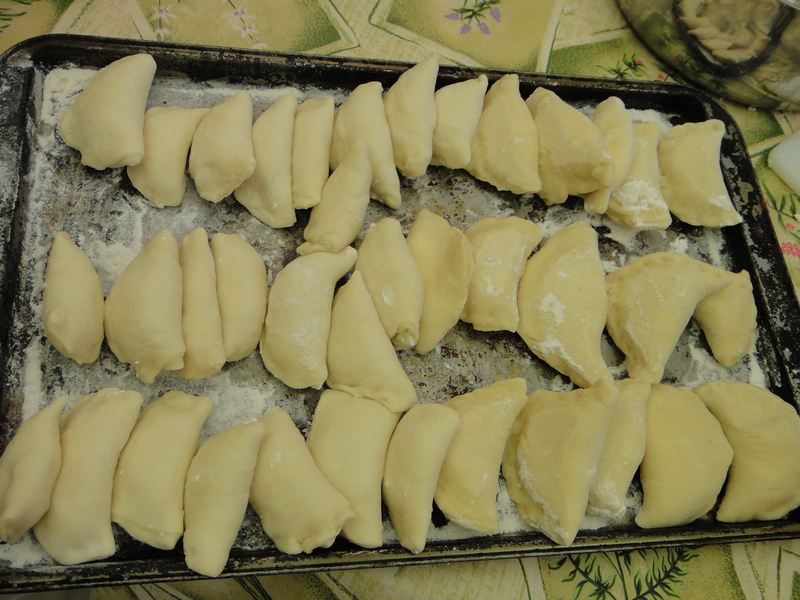 To prepare them, I used my Baba’s favorite method. 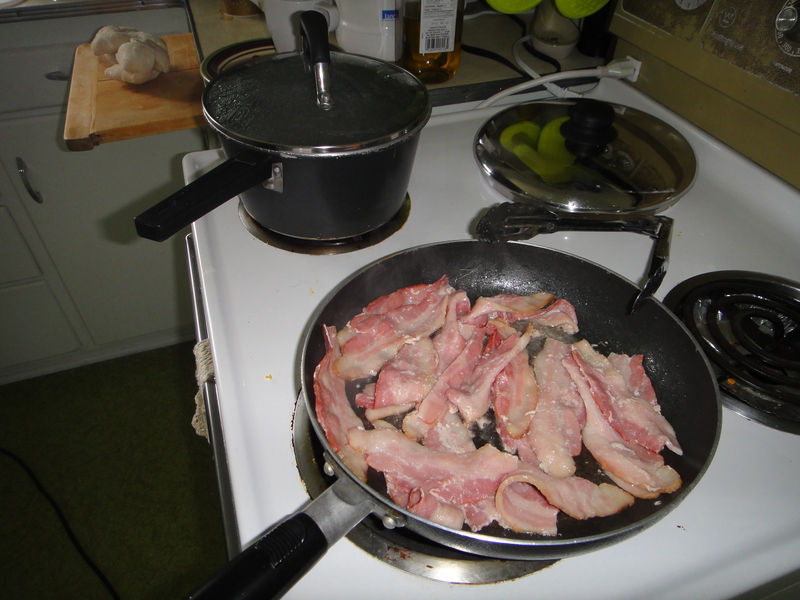 I began by cooking up some bacon, and boiling some water. 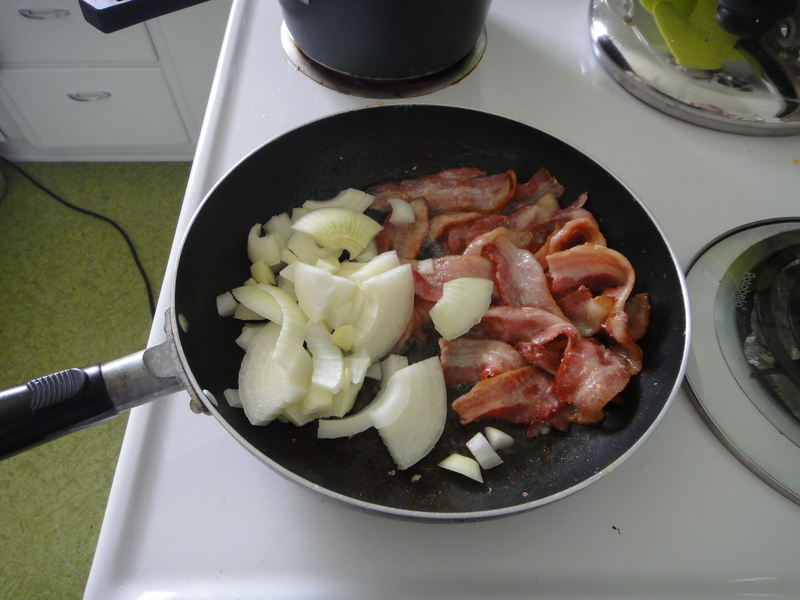 Ah, bacon and onions, the perfect pairing to homemade perogies! When they begin to float, transfer them to a pan with some oil (I used a bit of the leftover bacon grease), and fry them up until they reach your desired crispiness. I served them with a side salad, and a side of bacon. Yum! Oh and don’t forget your sour cream and jam. Then you’re in for a traditional Ukrainian feast! 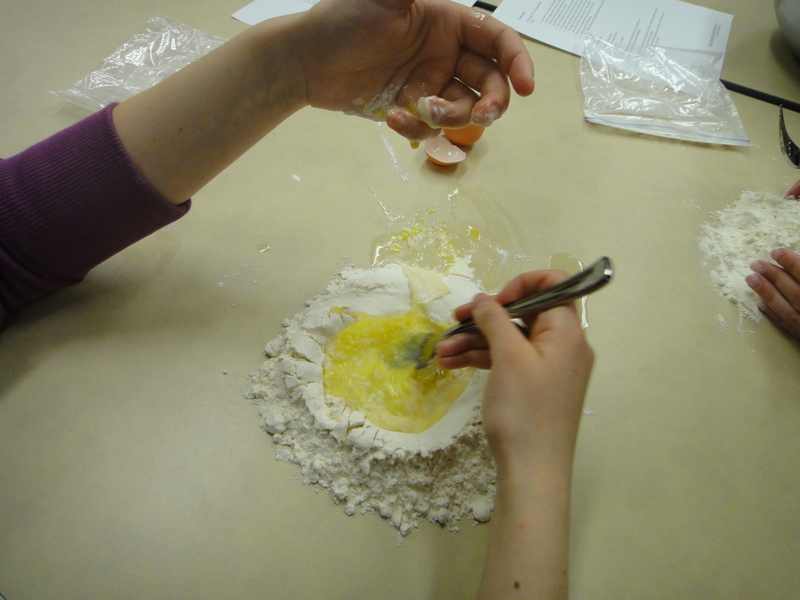 In a large bowl (we used a large pot), mix together flour, salt and bakign powder. Make a well in the centre. 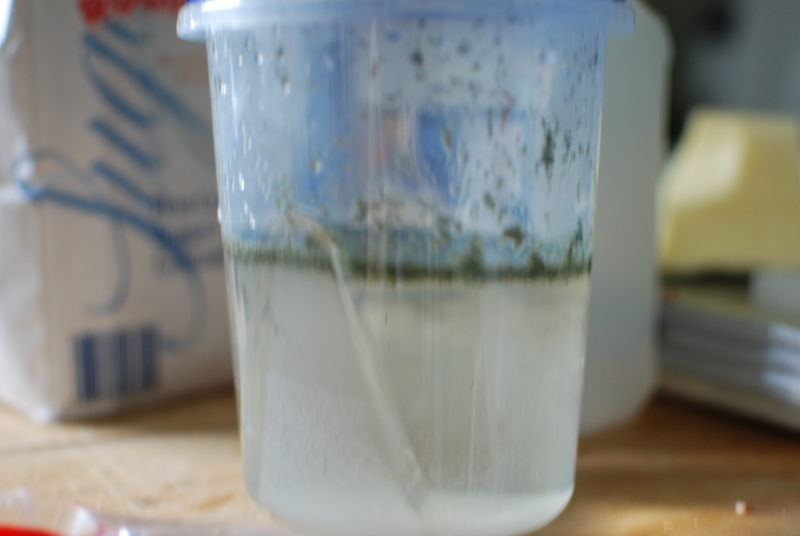 In a separate bowl, mix together vegetable oil, warm water (or reserve potato water), and the egg. Pour into the well of dry ingredients. 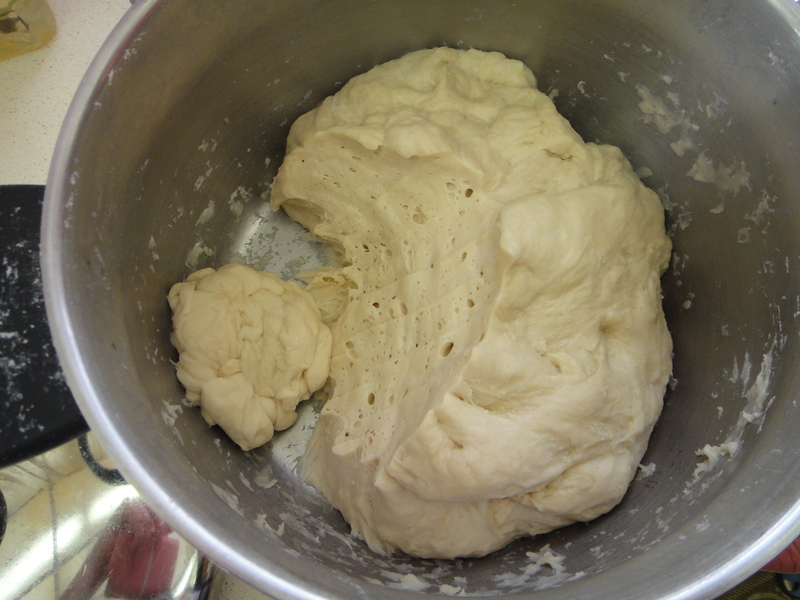 Knead dough for 8 to 10 minutes. 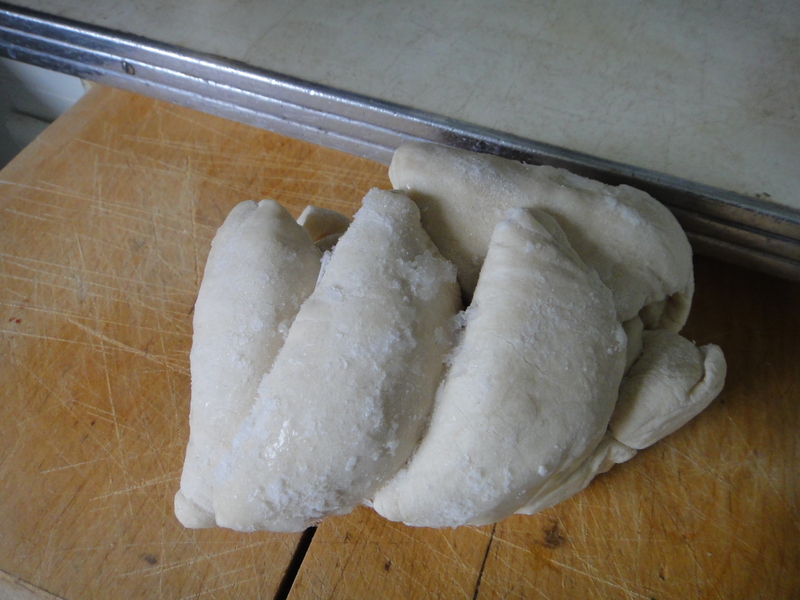 Cover dough and let rise for 2 hours. Roll out and fill. 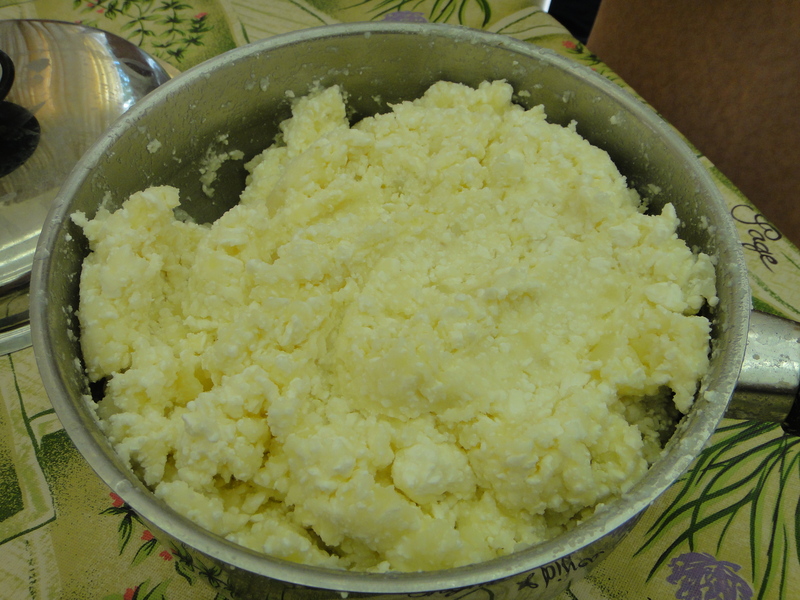 While you are waiting, make your filling by peeling, cooking and mincing 1 pound of potatoes and mixing them with 1 pound of dry cottage cheese. Season to taste with salt and pepper. 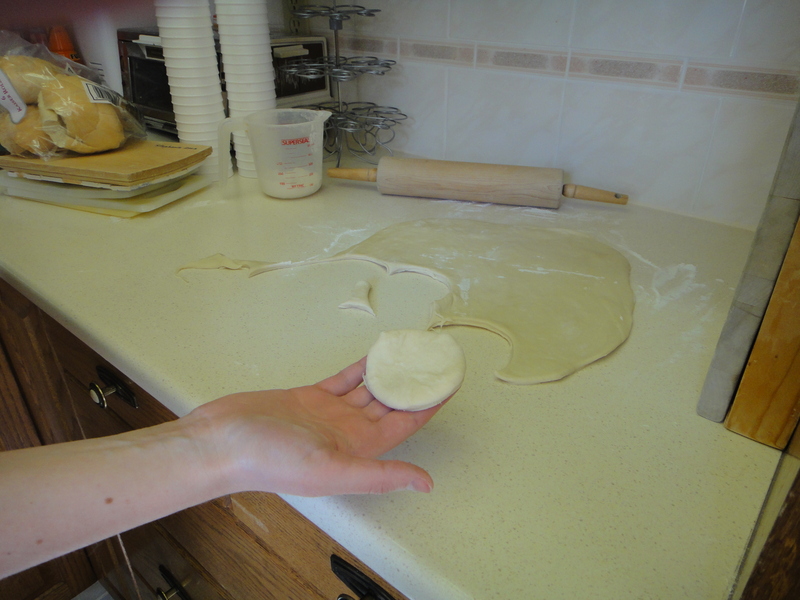 When dough has risen, roll it out thin and, using a round cookie cutter, cut out rounds of dough. 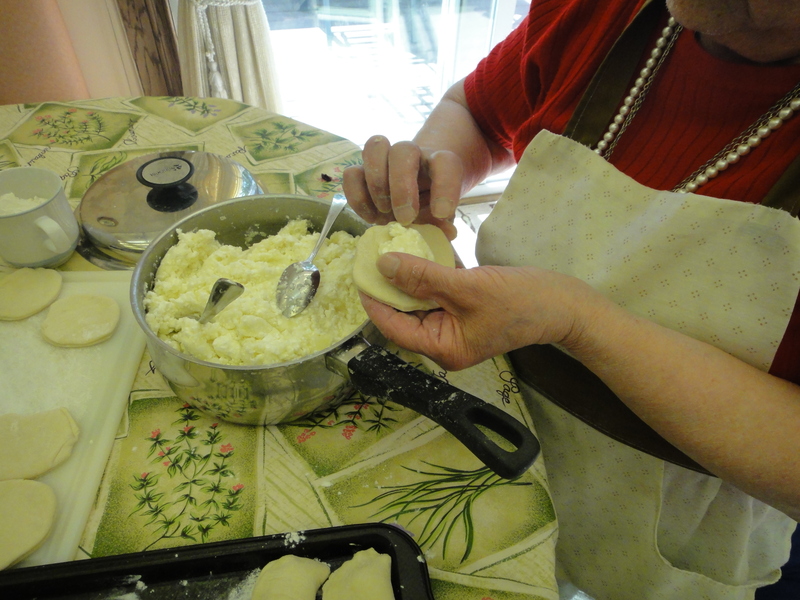 Fill with 1/2 tablespoon of filling and pinch all sides of perogy closed. Freeze on a baking sheet, which has been lightly dusted with flour. 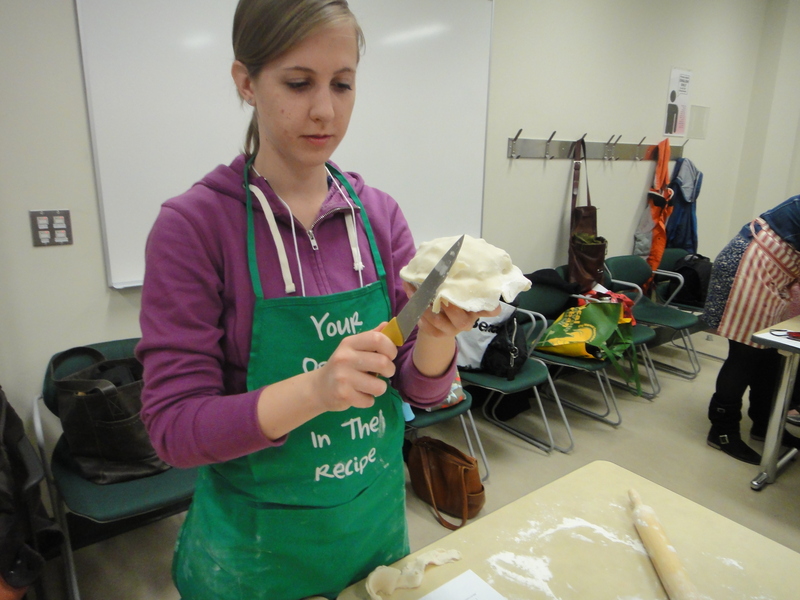 When frozen, transfer perogies to a freezer-safe ziplock bag. 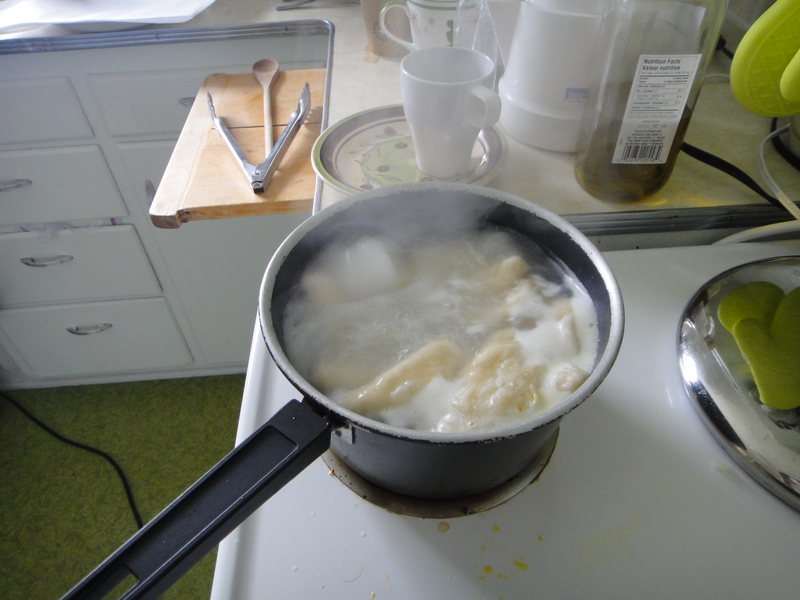 To serve, boil perogies from frozen. 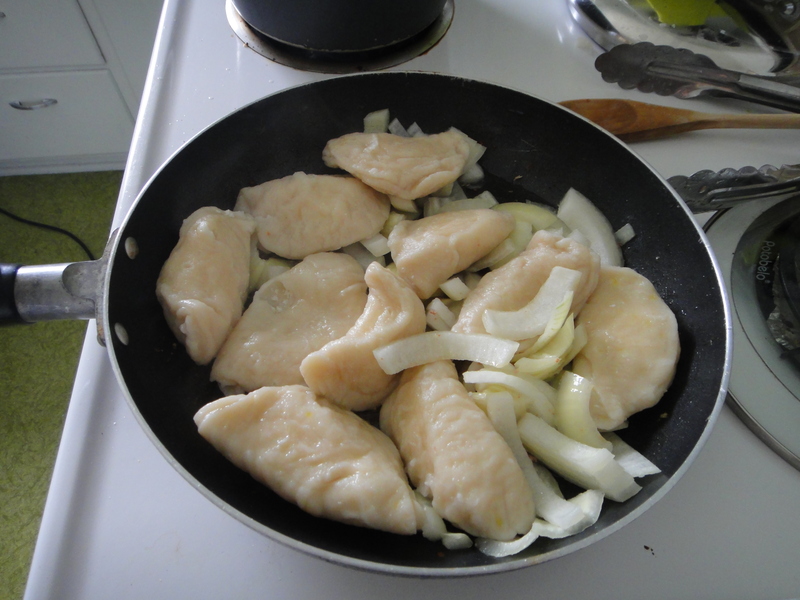 When they begin to float, transfer drained perogies to a frying pan with 1 tablespoon of cooking oil. Fry until desired crispiness has been reached. 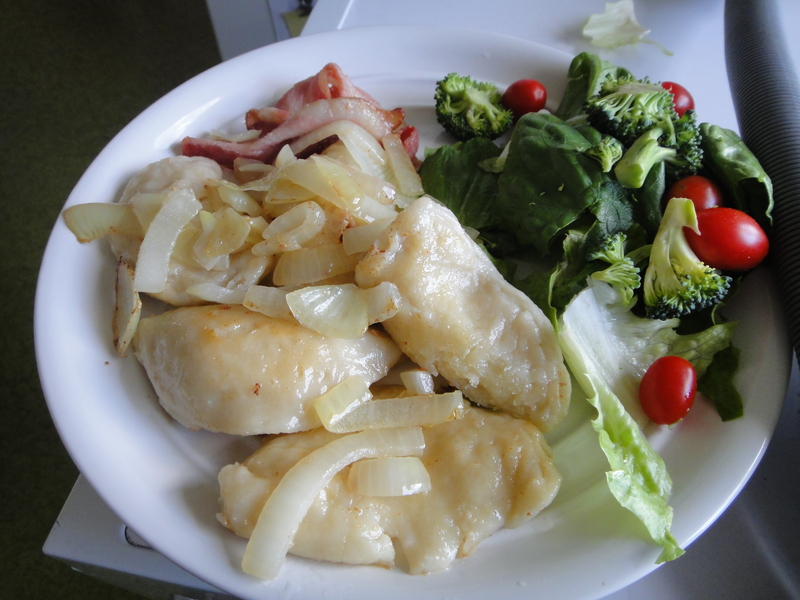 Serve with Ukrainian sausage or bacon and onions. Enjoy with sour cream and jam! Wow, this post is a little late… Sorry about that! We’ve been a bit busy on our end. My sister Michou got married yesterday, quite the celebration! 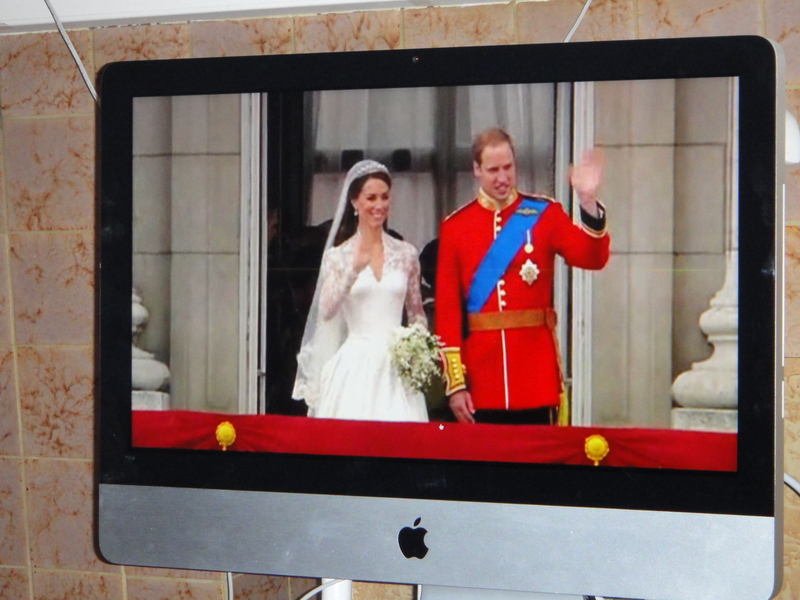 That, of course, postponed my posting on the royal wedding. But here it is! I decided to make some English classics as finger food for my Royal Wedding party: Scones with Raspberry Butter and Cucumber Sandwiches. Hmm… Delicious! I didn’t make them 100% whole wheat, as I still wanted them to be light and fluffy. 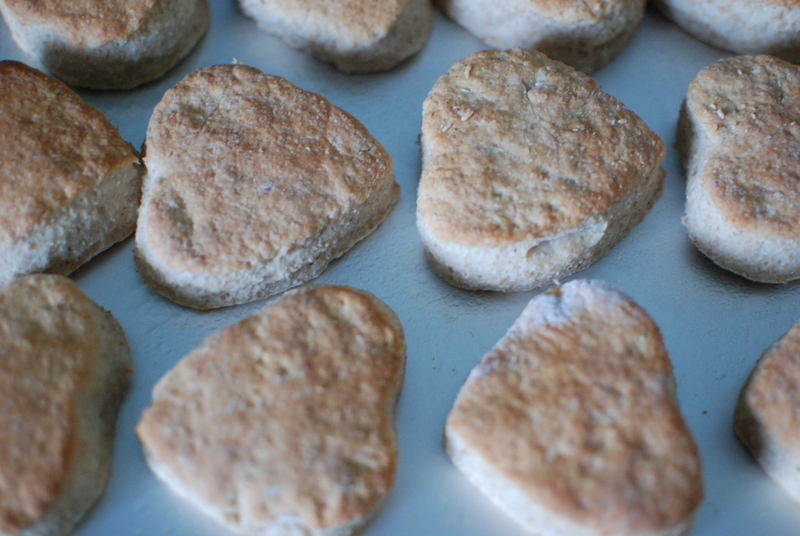 I used a heart shaped cookie cutter. They turned out so well! Here they are, all nicely baked. 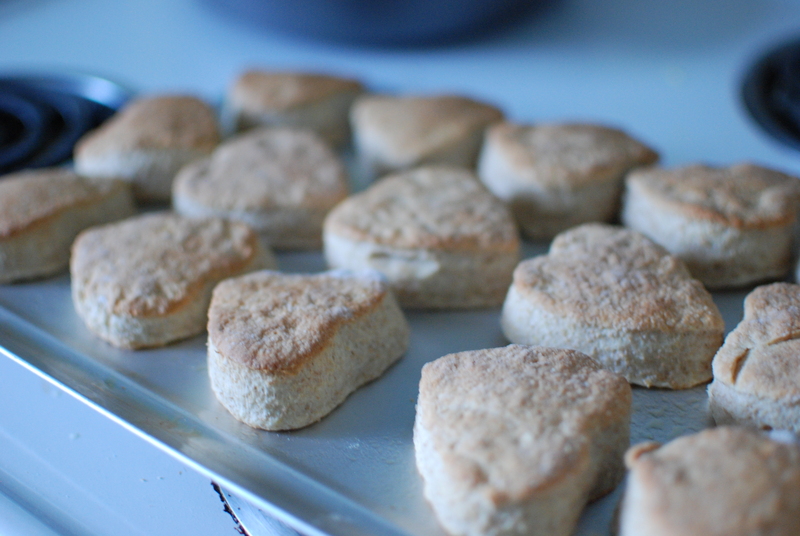 Delicious little pillowy scones. They were so good! 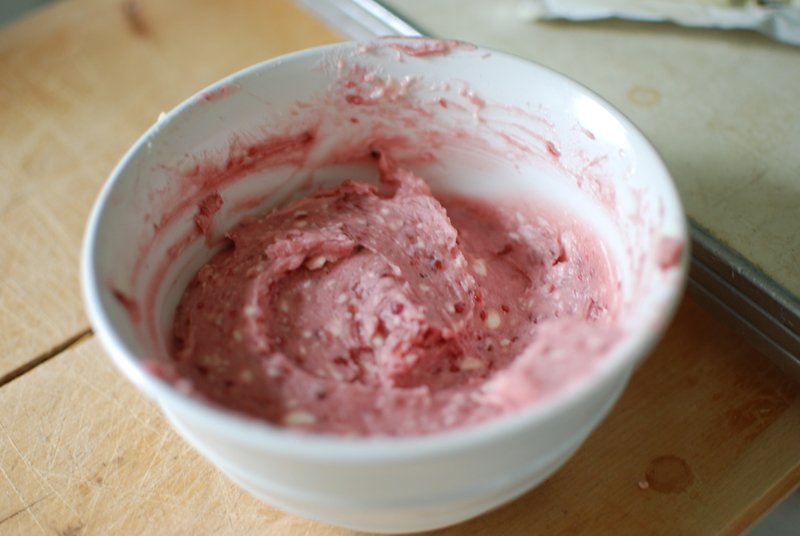 Raspberry butter is so easy to make and is such a treat on scones. It really does add a lot to your baking. I would suggest having some on hand, even in your freezer, for special occasions! I used generic raspberry jam. And mixed it half and half with butter. Using a whisk, I whipped it up as best I could. Tada! 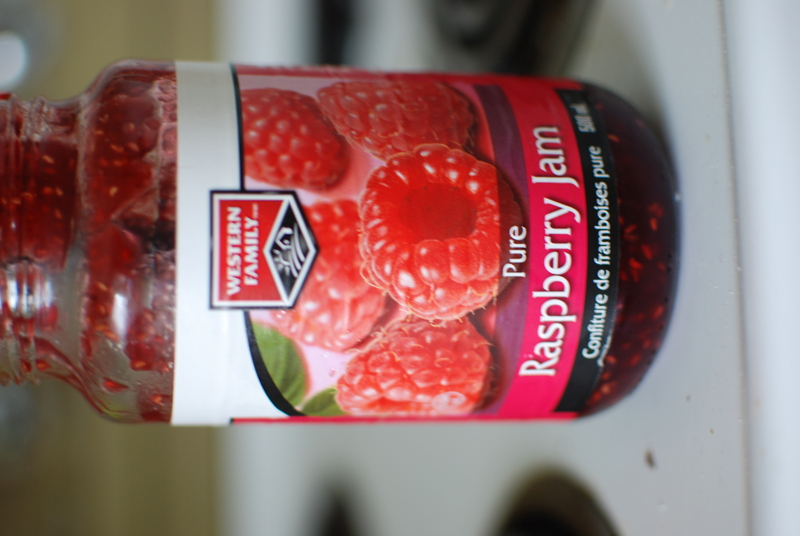 delicious and easy raspberry butter! 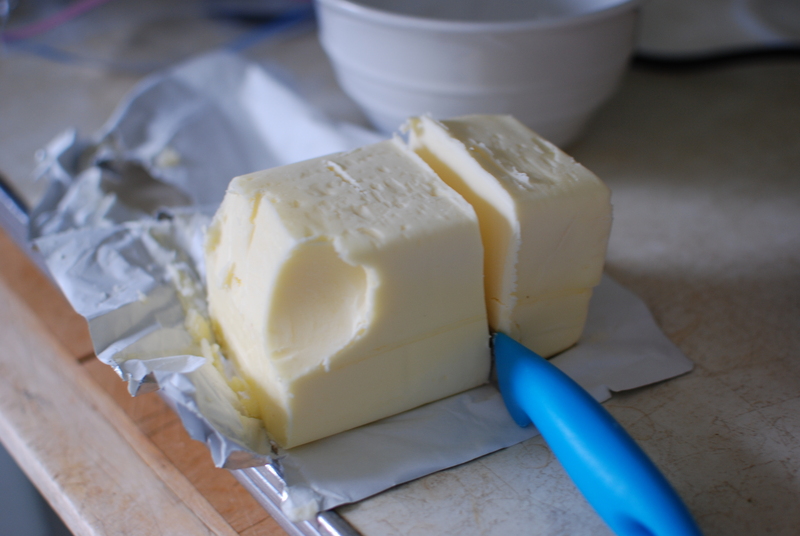 Warm butter briefly in the microwave, until soft. 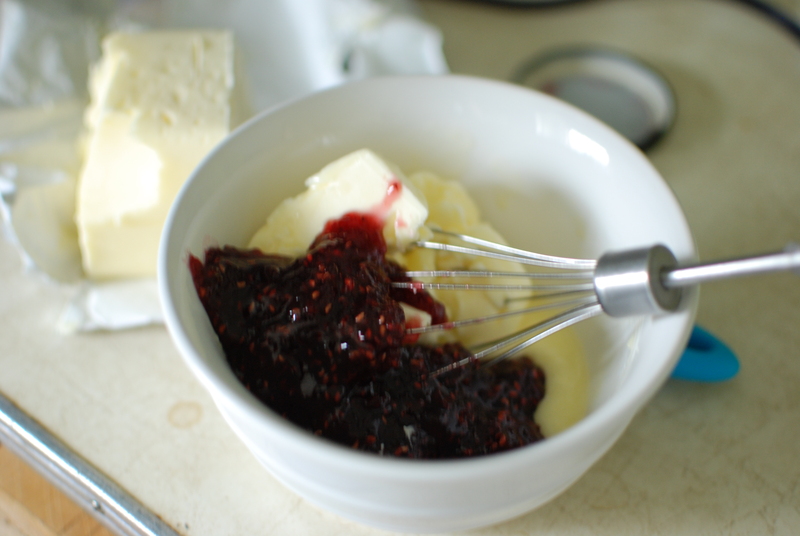 Whisk jam and butter together until smooth. 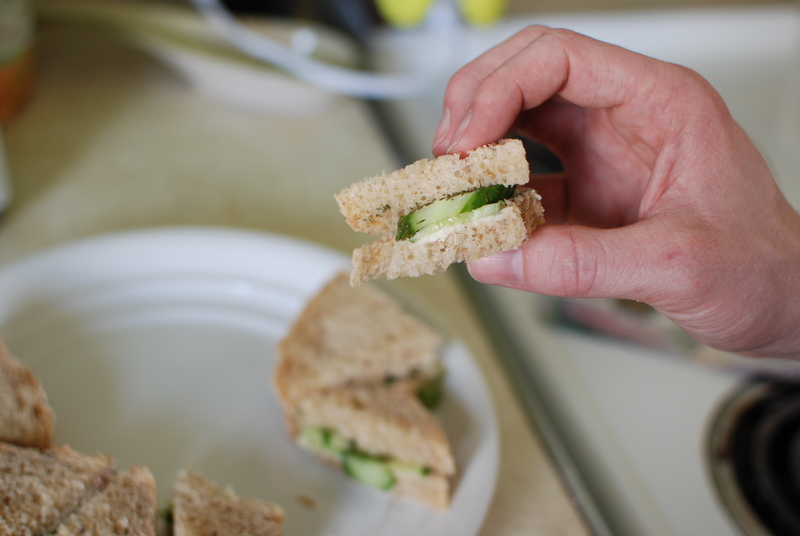 The cucumber sandwiches were super easy. I only used three ingredients for the pickling base. 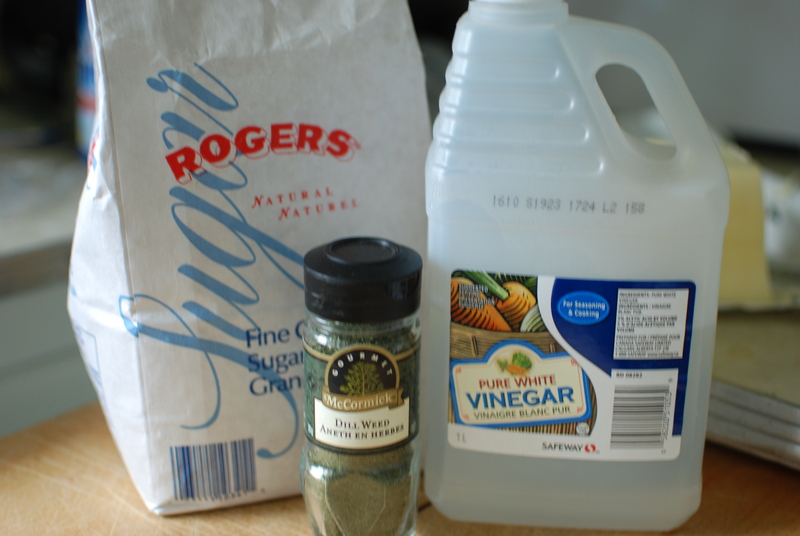 Vinegar, sugar and dill. Mix them together in a Tupperware and shake until the sugar is dissolved. I used local mini cucumbers. These are so tasty! I cut them all up and let them marinade overnight. I used whole wheat bread. Yummy. I used margarine to keep the cucumbers in place on the sandwiches. 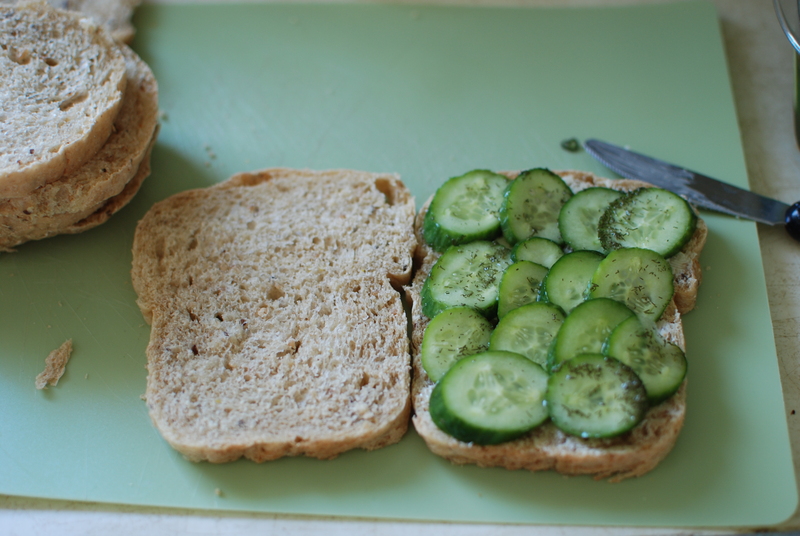 Then I filled the sandwiches with marinated cucumbers. 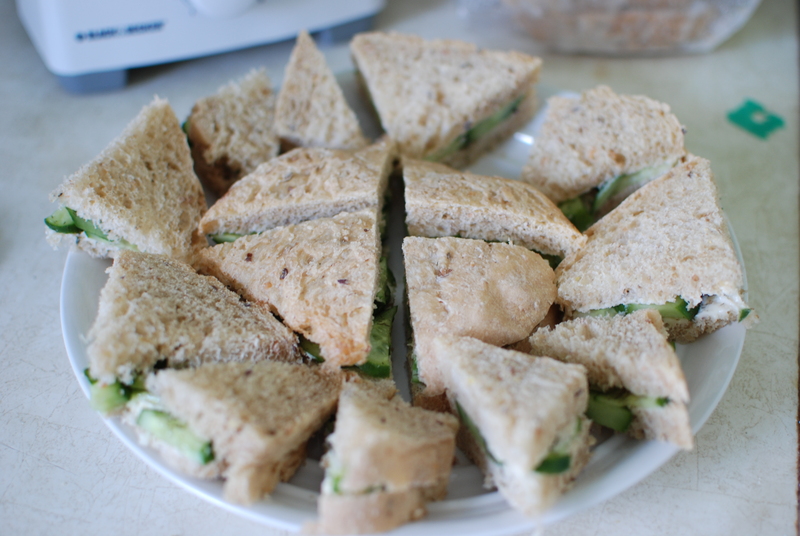 I cut them up in little triangles, just like at a real English Tea. We ate them while we watched William and Kate get hitched! 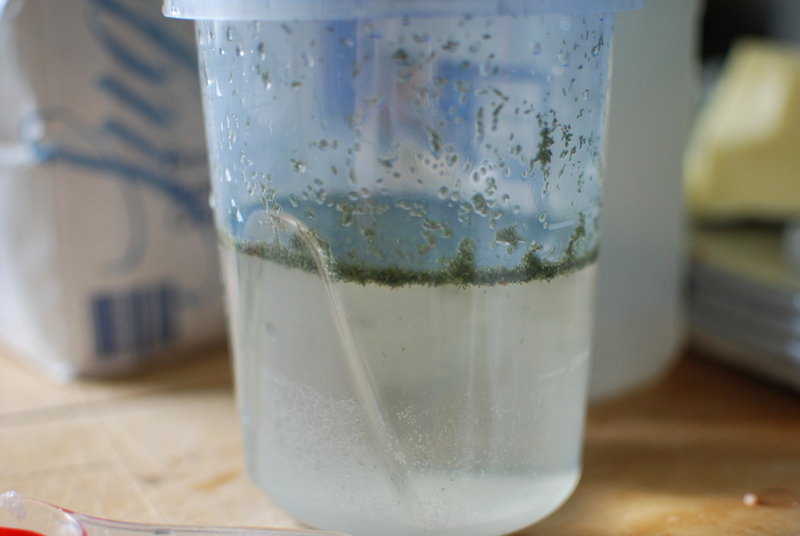 Combine sugar, vinegar and dillweed and stir until the sugar is dissolved. 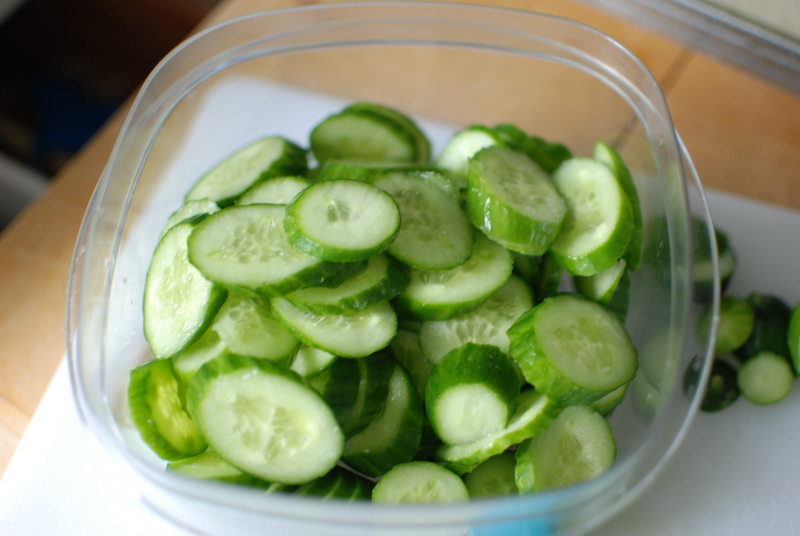 Slice the cucumbers up and marinate them in the vinegar mixture overnight. 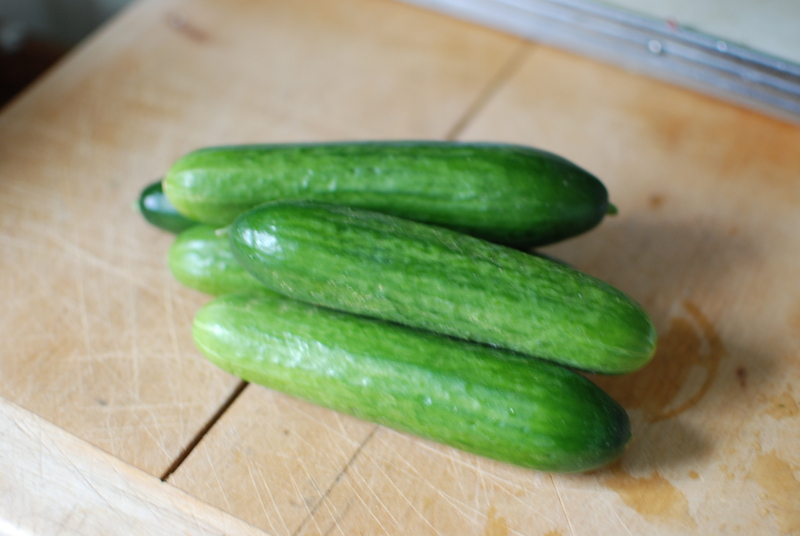 When the cucumbers are marinated, spread the margarine on the bread, line with cucumbers, and slice sandwiches into triangles. Enjoy! 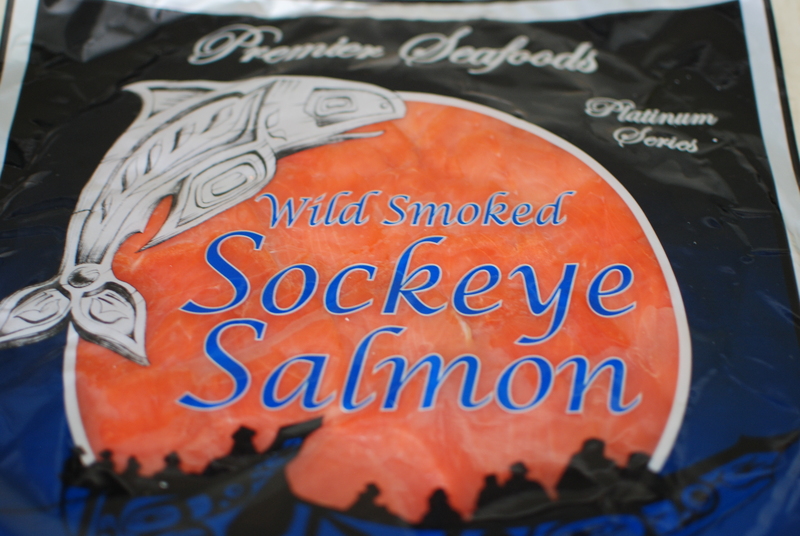 Smoked Salmon is probably one of my favorite foods (I know what you’re thinking… she has too many favorite foods!) But I’m serious this time! If I had to choose, I would say smoked salmon is my favorite food, with cheese. Hmm… That’s why when I saw this recipe on Foodgawker, I just had to try them out! They were super easy to make too! 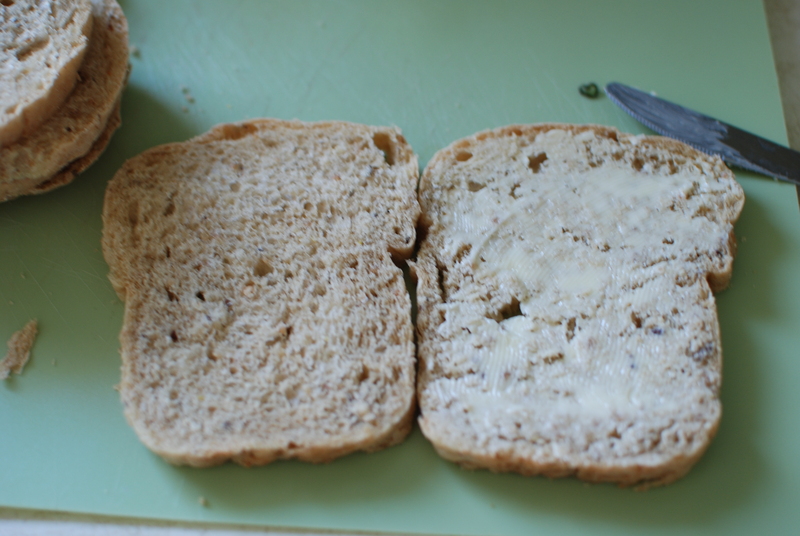 I used Grand-ma Bear’s bread from the Old Strathcona Farmer’s Market. She makes the best bread at the market. So fresh, light, fluffy and reasonably priced! 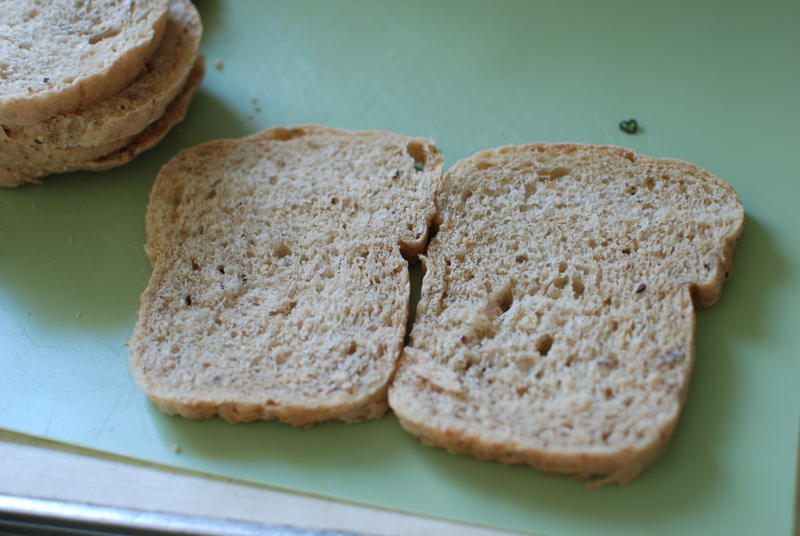 To make the rolls, take a piece of whole wheat bread and chop off the crusts. I used wild sockeye salmon. Not local at all, but hey, you have to spoil yourself sometimes! 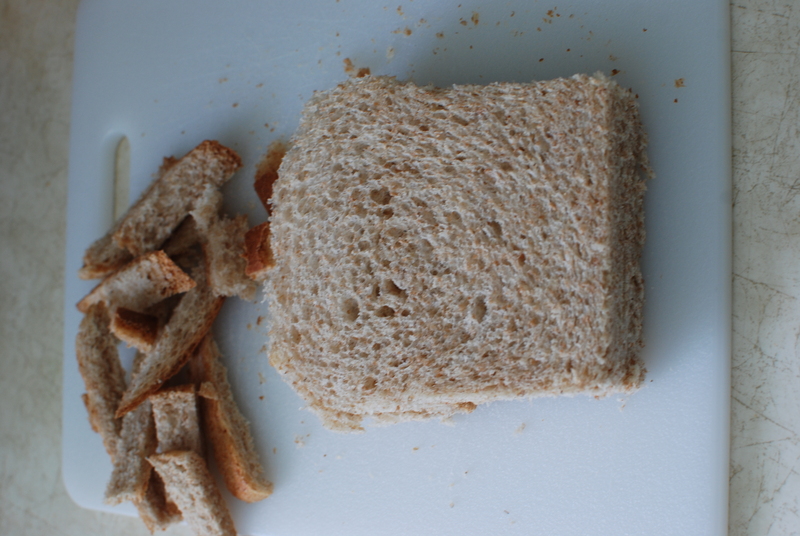 I took the bread slices, and flattened then with a rolling pin. 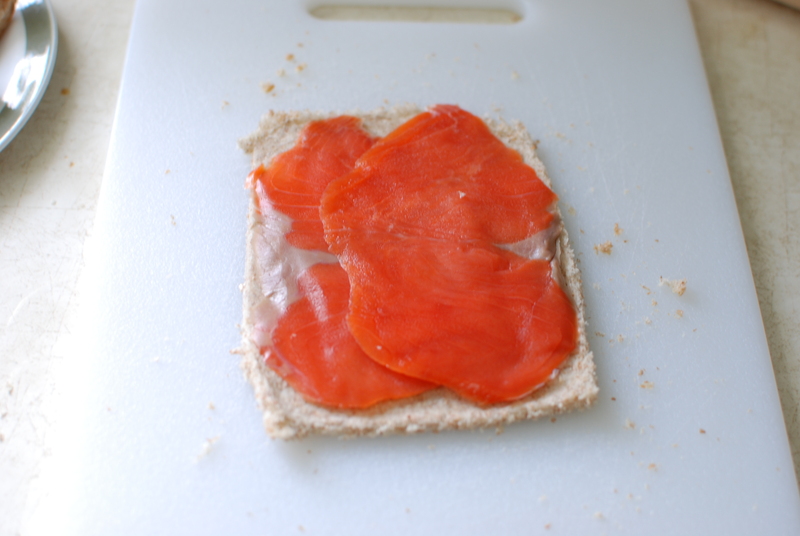 Then I layered the bread with two pieces of beautiful, pink, fresh pieces of delicious smoked salmon. Next, I spread some light, plain cream cheese on top of the salmon. 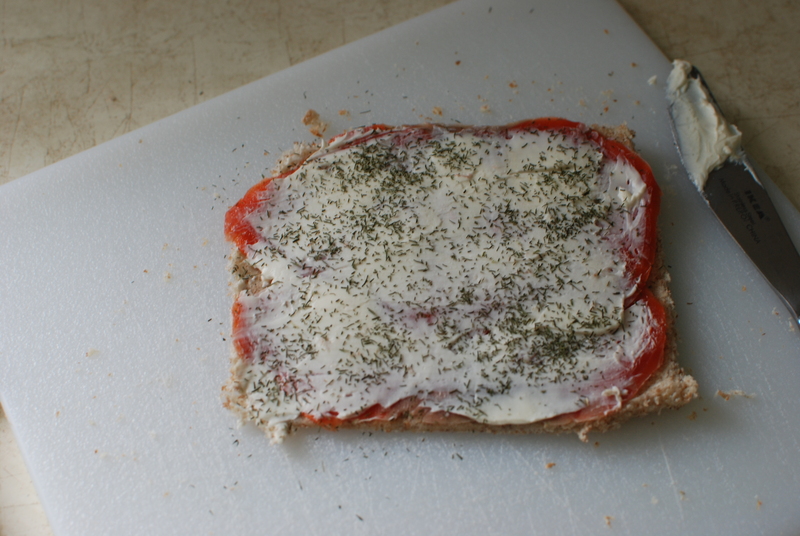 Then sprinkled it with dried dill. Next, I rolled it up in saran wrap, then let it hang out in the fridge for 3 hrs before serving it. When ready to serve, slice them up and place on a fancy plate! 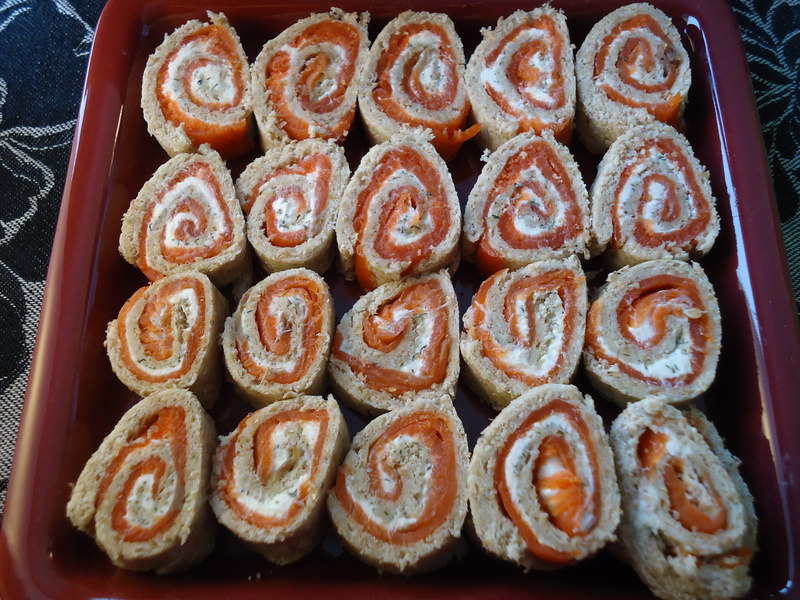 They turned out looking a little like sushi rolls, but tasted more like lox. They were good though. I could eat a whole plate-full of these!! For your next party, go ahead and give these a try! 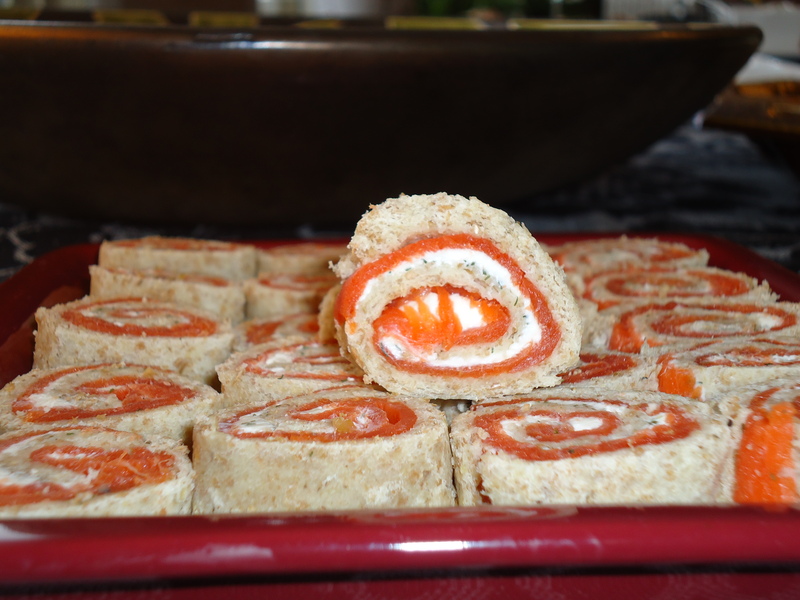 They are super easy and were a huge crowd pleaser. I love making appies! 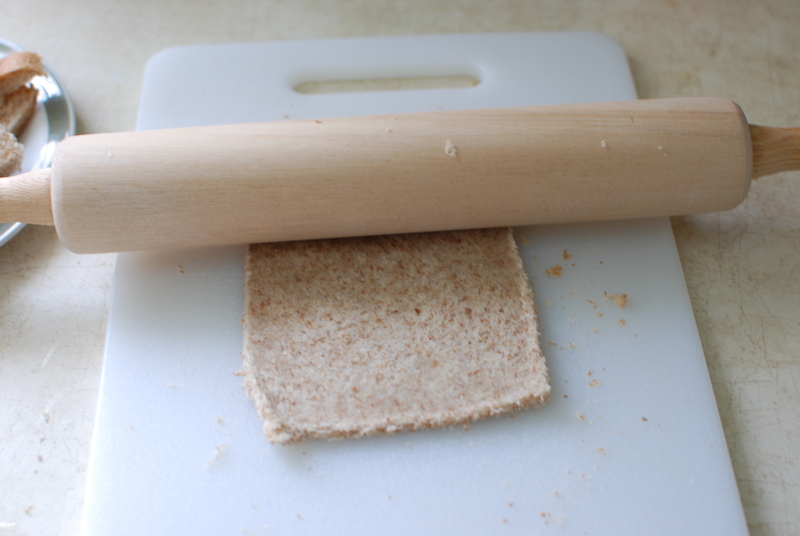 Cut off the edges from the bread and thin it out using a rolling pin. 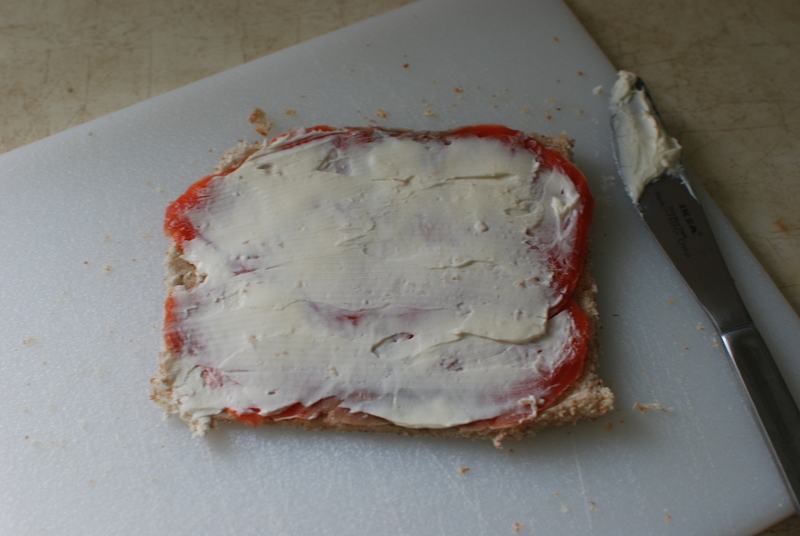 Spread the cheese generously, place two slices of salmon and roll it up gently from one end. Place a cling wrap ready. 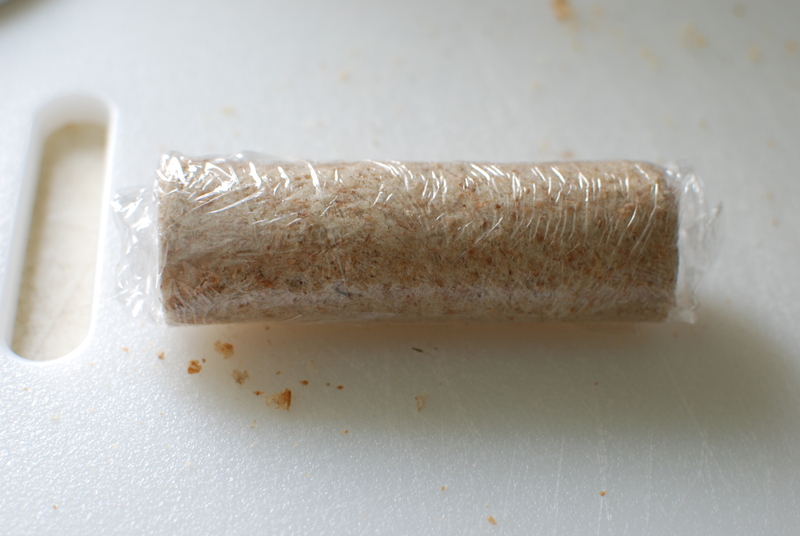 Keep the rolled bread on one end and roll it up tightly. Refrigerate for at least 3 hrs. 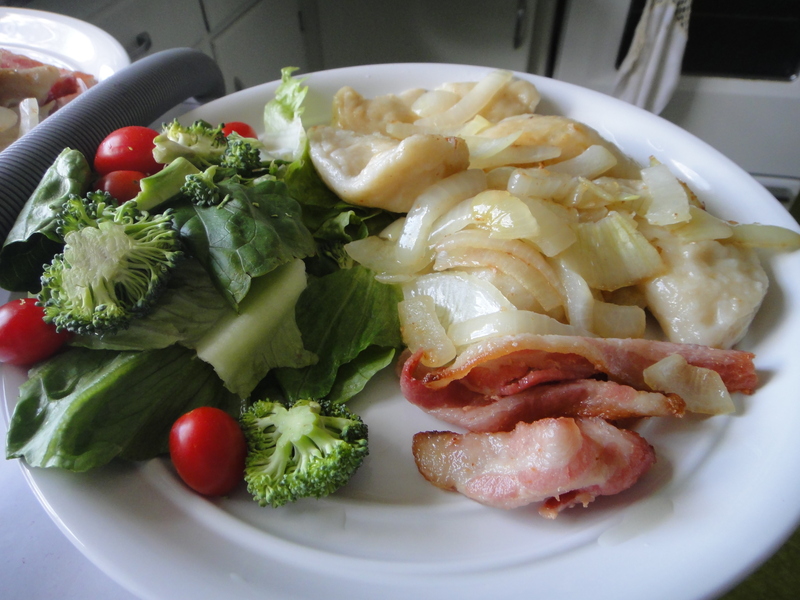 Just before serving, remove cling wrap, slice it up and arrange on a fancy plate. 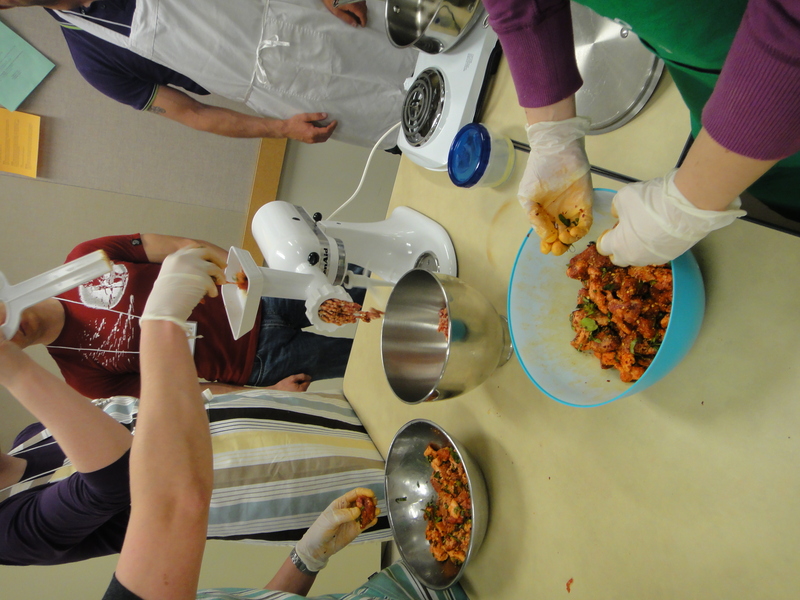 Eat Alberta: A Day of Local Foodie Awesomeness! 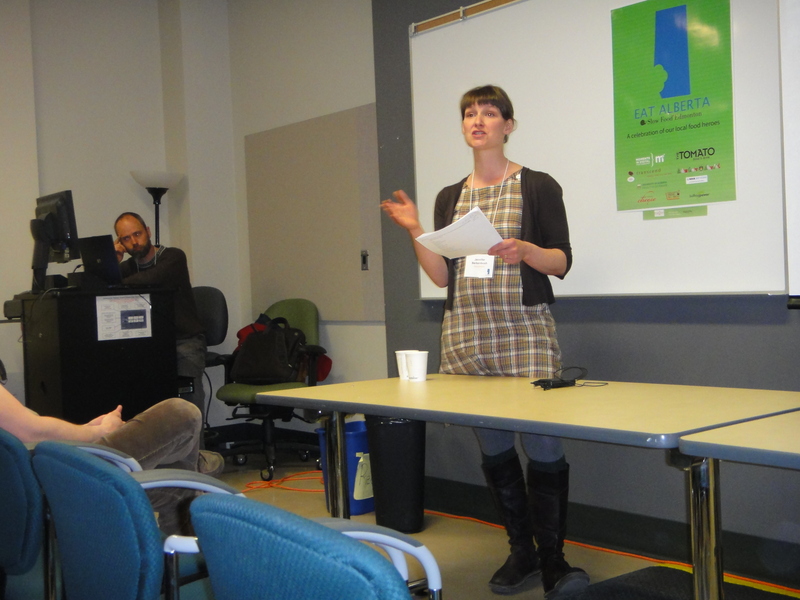 Yesterday was the much anticipated Eat Alberta Local Food conference. It was wonderful! A full Day of local foodie awesomeness, where I got to nerd out over how much I love food, and local food at that, with other local food lovers! 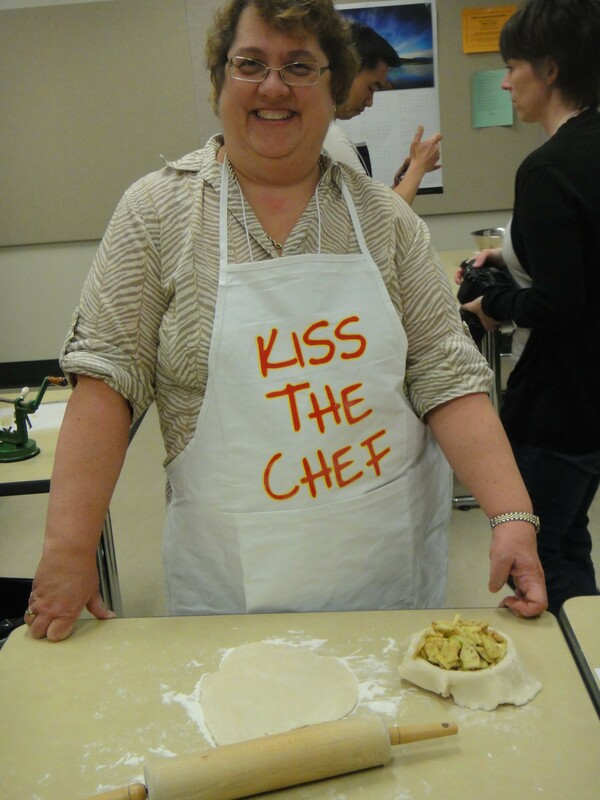 Before I begin to tell you the tales of the day, I wanted to send out a HUGE Thank you to Valerie and to Slow Food Edmonton for organizing such a wonderful day! I had so much fun!! My mom and my sister Michelle took time out of their super busy lives (My sister is getting married next weekend!) to partake in the fun. The morning Keynote was wonderful! Jennifer BerkenBosch and James Vriend recounted their tales of falling in love with food, and endeavoring to sustainably feed their family with the food that they’re grown with their own two hands. I loved the uniqueness of their story; how they gave up with urban lives to buy a farm and live sustainably on it. It was a great kick off to the day! 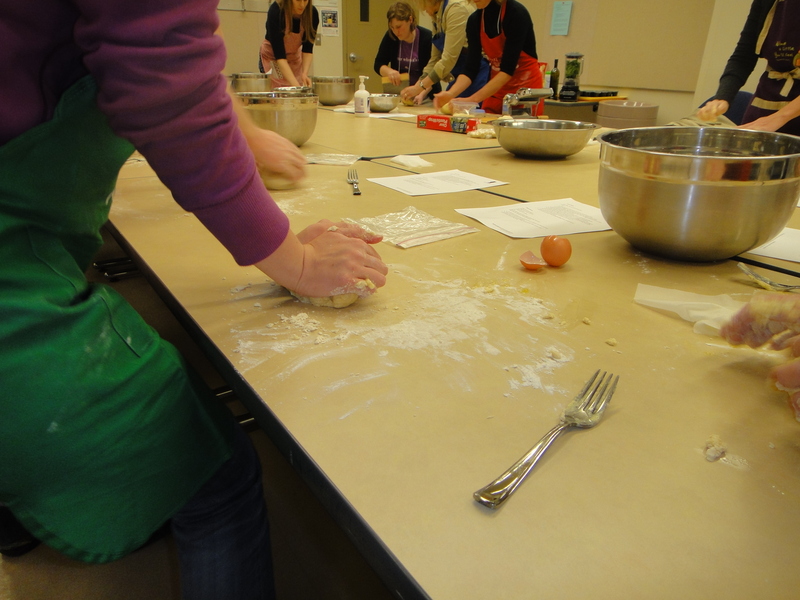 Our first hands on session of the day was Apple Pie Making with Christian Miller, who so kindly shared her expertise with us, as well as her family’s secret tricks to baking the best pie every time. 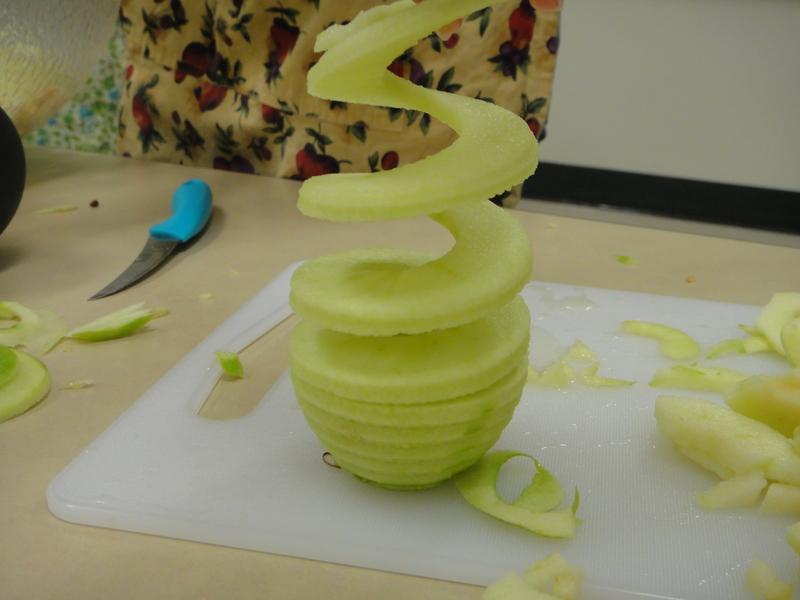 She also let us play with the apple peeler/core-er. It was so cool!! 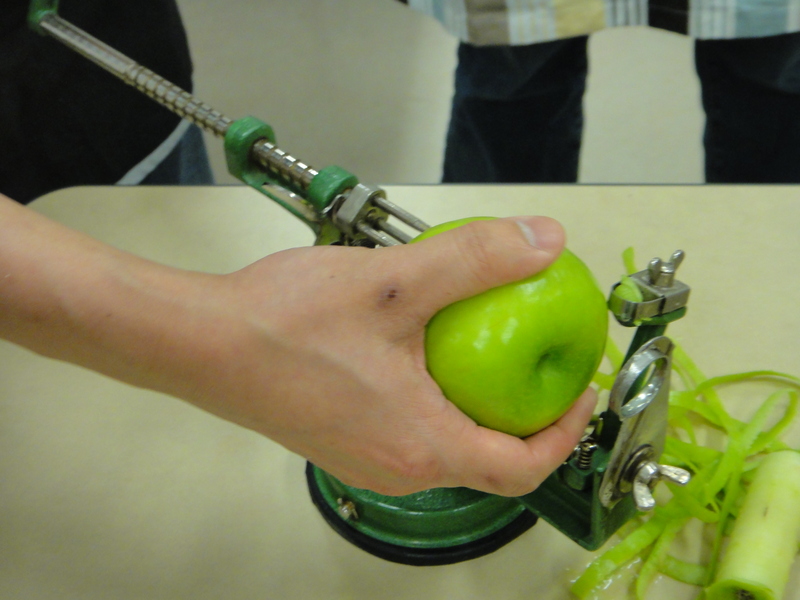 All you do is stick the apple onto the spikes in the machine. And watch the entire apple get peeled on its own!! This machine even took out the core. 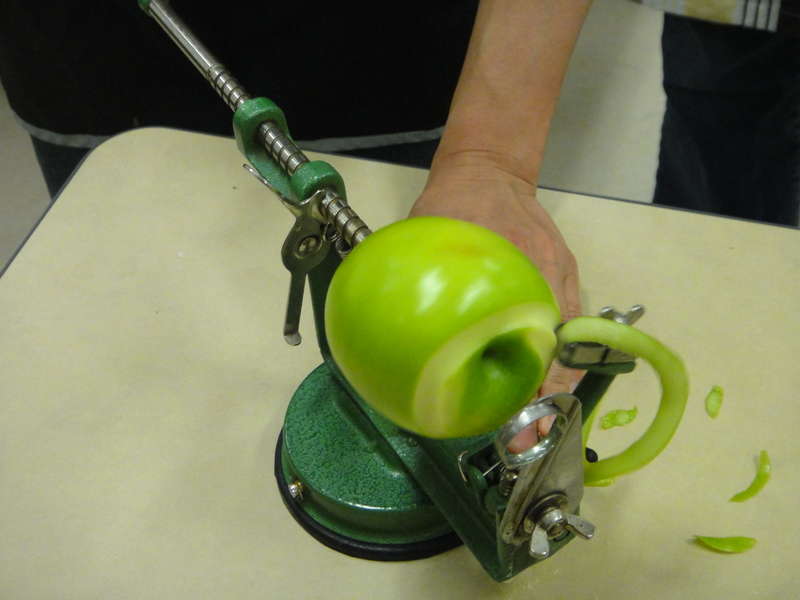 Lucky us, we barely had any work to do to get the perfectly peeled apple! 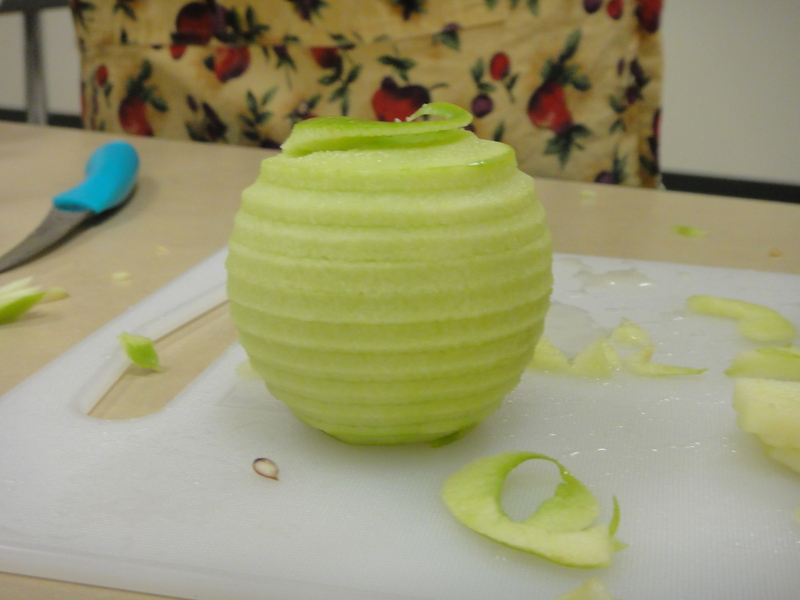 Also made for a pretty interestingly cut apple! 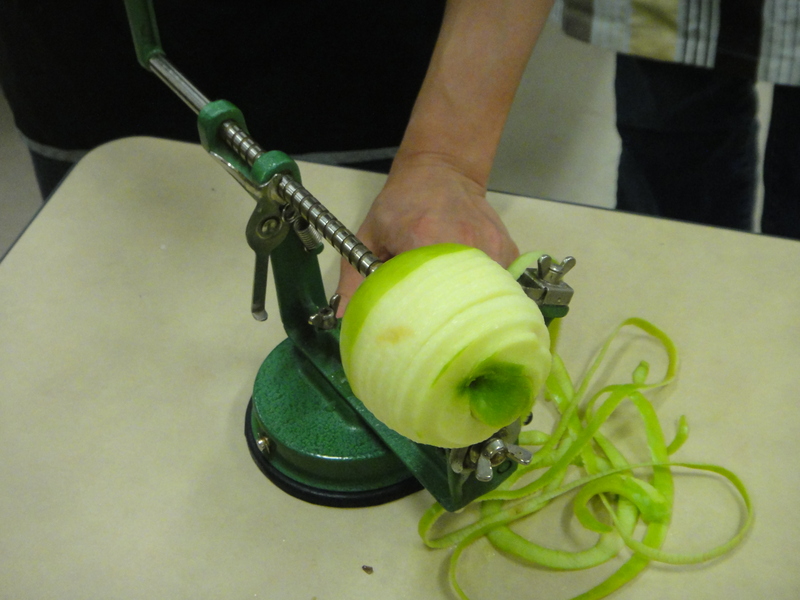 After we played with the apple peeler for a while, Christian explained the fine art making fresh pie filling. 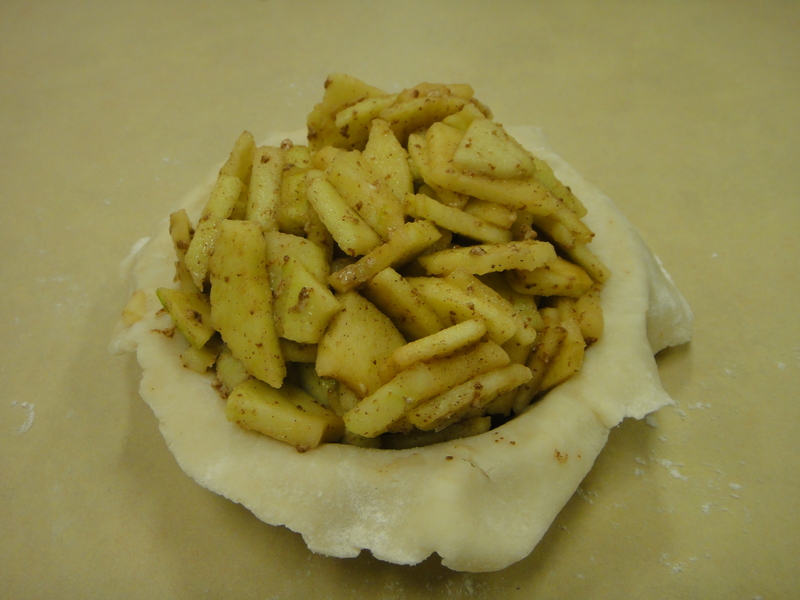 Always use a tart apple, she says, and then add brown sugar. 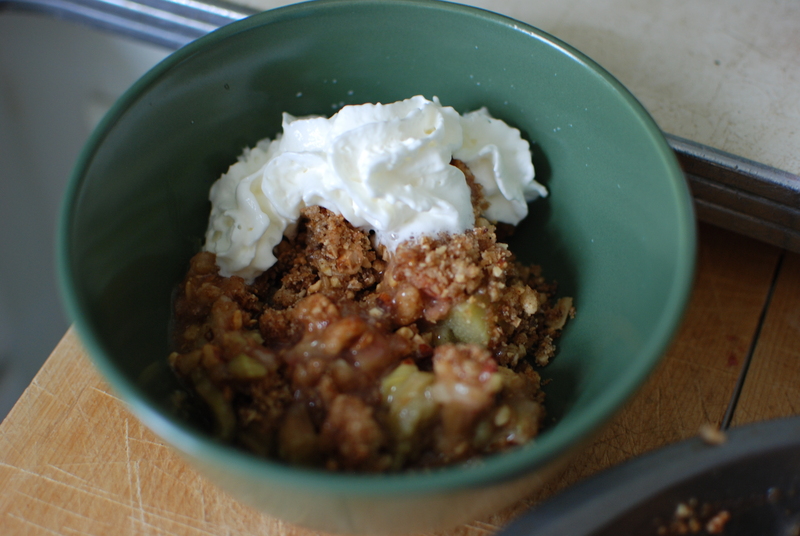 You know that you’ve added enough brown sugar when the apple tastes at a perfect balance between sweet and tart. Next, don’t be afraid of cinnamon. Add a lot, because it tastes good! The dough was a lot easier than I thought it would be! Apparently, Christian uses the recipe on the side of the Tenderflake box! We each got to take home a mini pie. 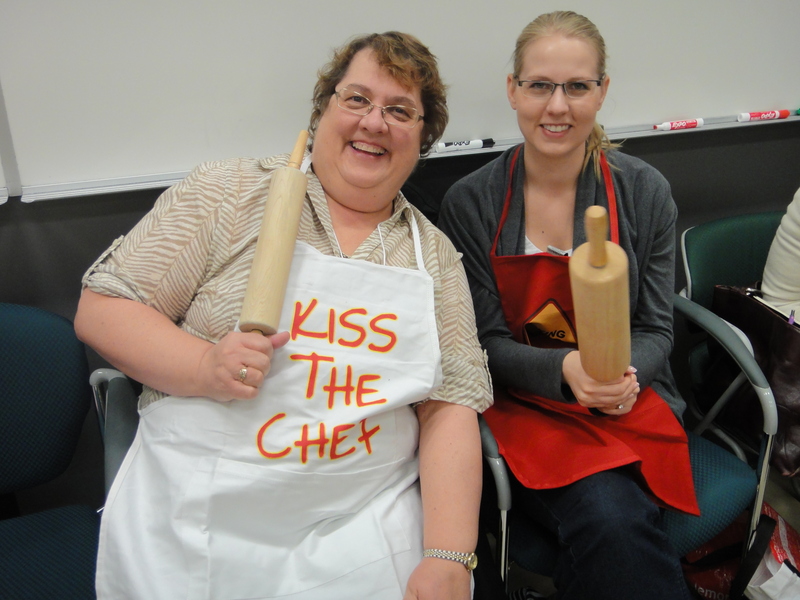 It was quite the fun experience to learn how to cook altogether! Here’s my overstuffed pie! I was told to bake it with a cookie sheet underneath, as it is sure to explode in my oven! My mom, so proud of her little pie! Here’s me trimming the edge of my super huge pie. Beautiful! 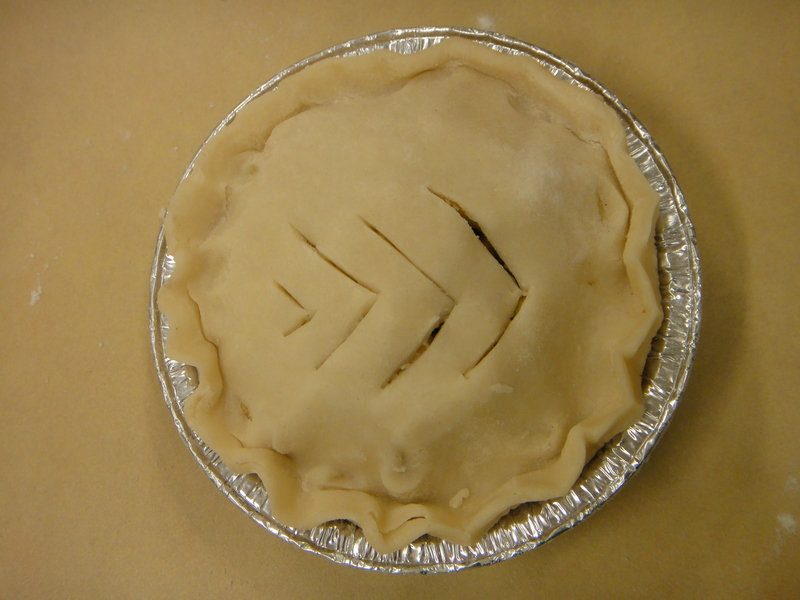 I got tips on how to add finishing touches, like curling up the edges for that classic apple pie look, and adding different types of ventilation holes! 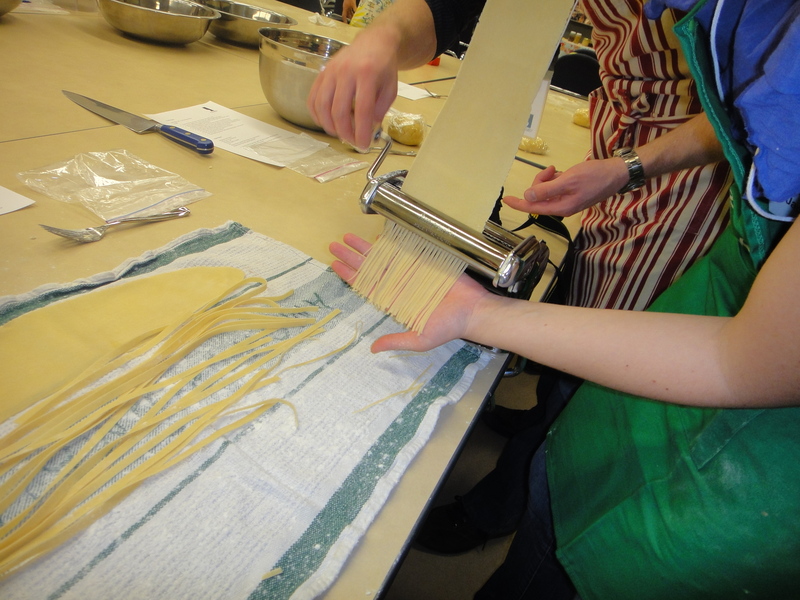 The recipe for making homemade pasta is actually way easier than I thought. All you need is 1 egg per 100 grams of flour. No seriously, that’s it. I’m not lying!! 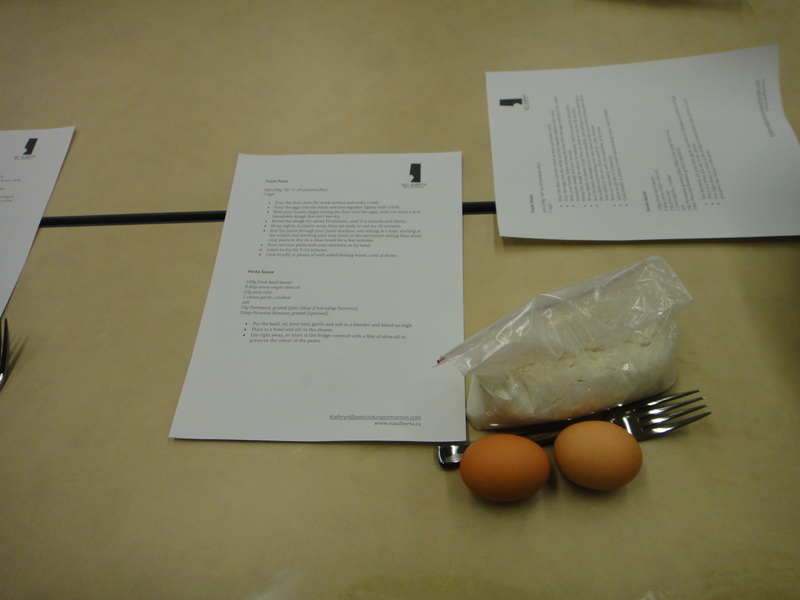 Kathryn showed us a technique that you create a little well, and crack your egg in it. 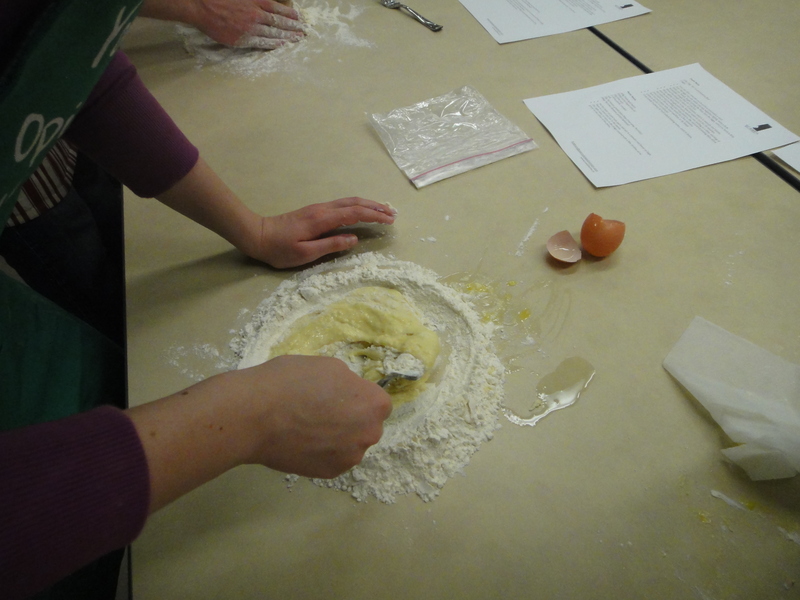 Next, you beat the eggs until they are incorporated into the flour, and you are able to kneed it. 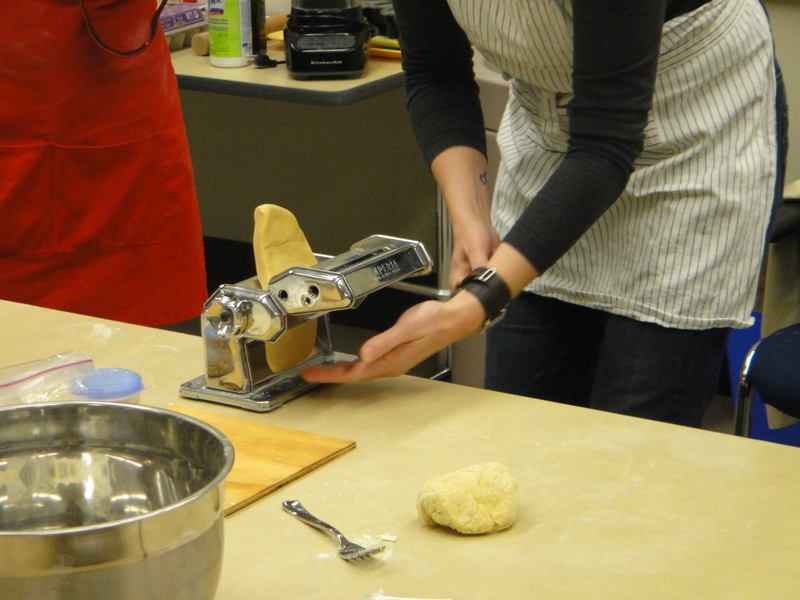 This is me, kneeding my dough with my full force, because the dough was so thick. While we were waiting, Kathryn gave us a demonstration on how the Pasta press works. Very cool machine! 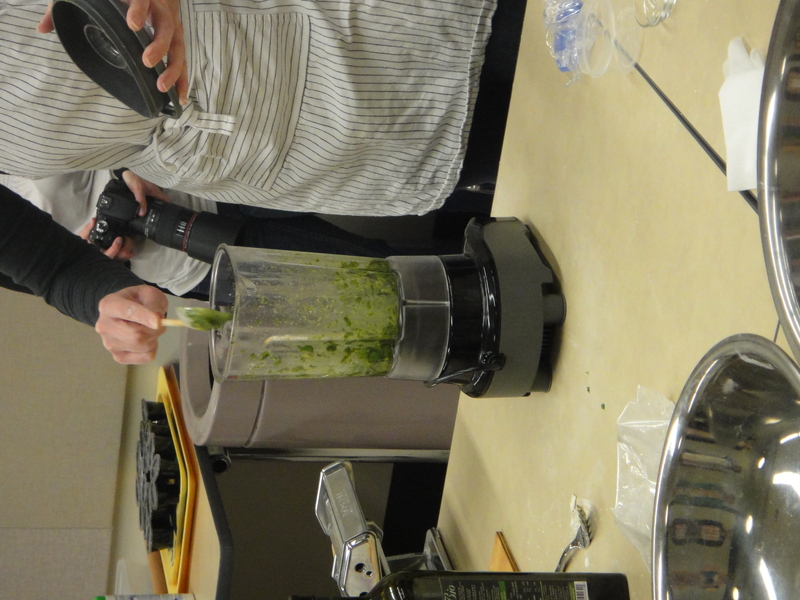 Also while we were waiting, Kathryn gave us a demonstration on how to make our own pesto. Its really simple. 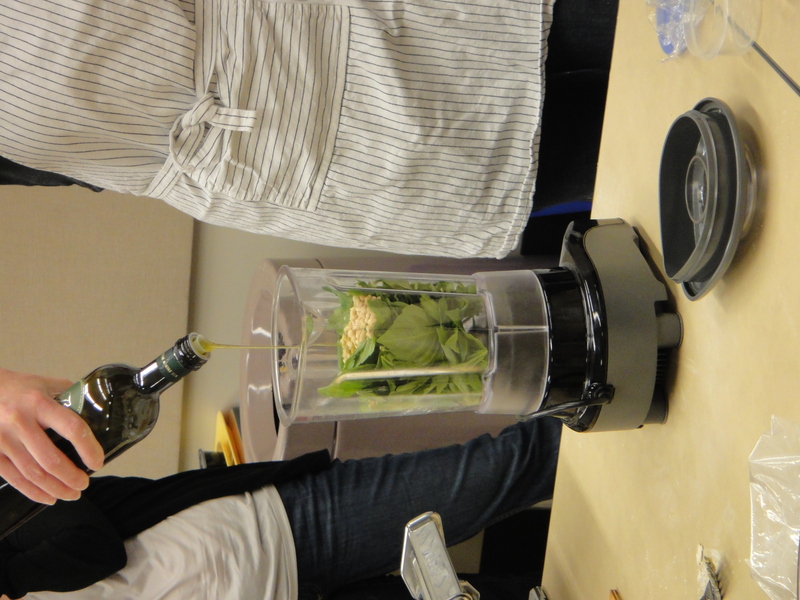 Use fresh basil, olive oil, garlic, pine nuts and Parmesan cheese. That’s it! Stick it in a blender, and blend it up fine. Toss with freshly made pasta! Delish! Chunky, delicious, fresh homemade pesto! 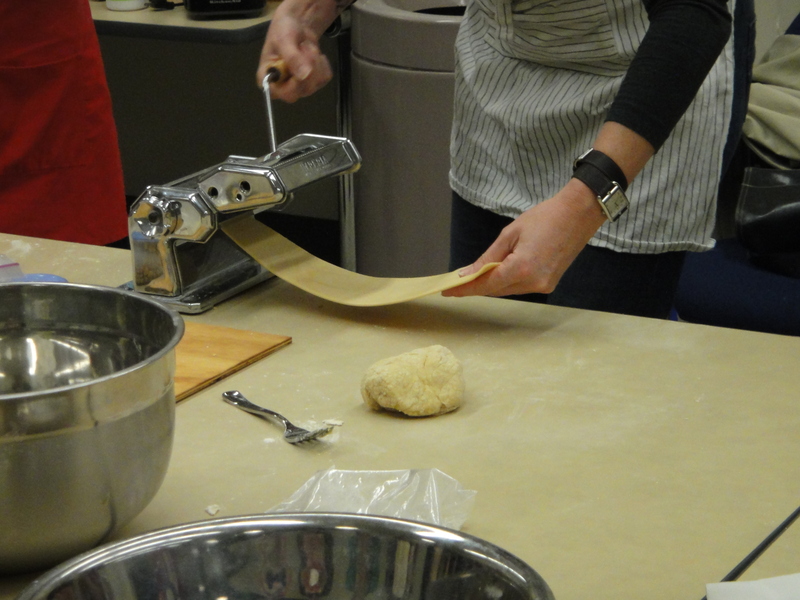 We stayed a bit longer into lunch to cut our pasta. It was actually really fun! We had the most amazing lunch! 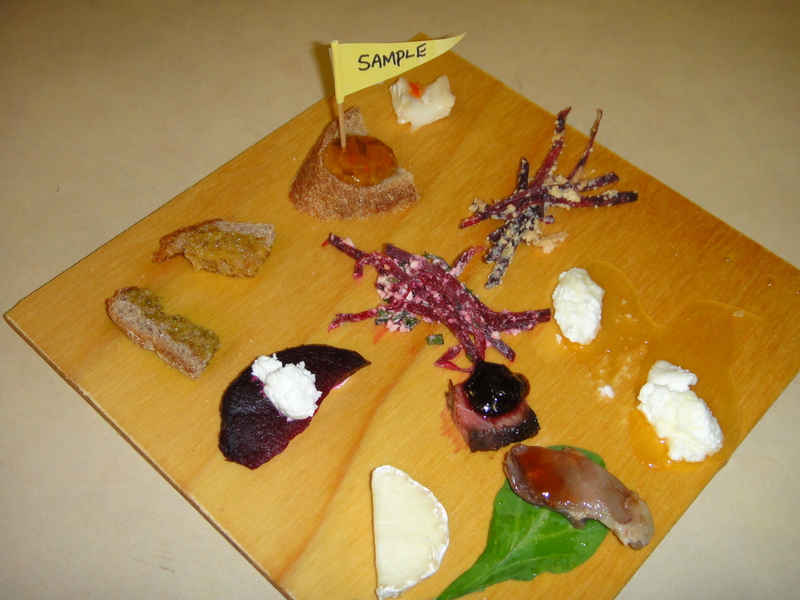 This was the sample platter, telling you what cheesy ordevres there were to choose from. Wow. Do I ever love goat cheese. This was an awesome foodie lunch! 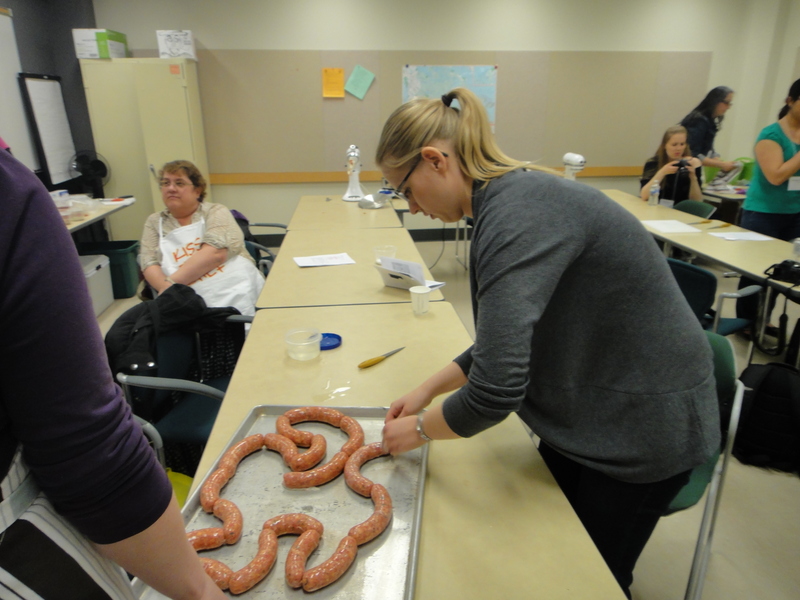 After lunch, it was time to make some sausage. 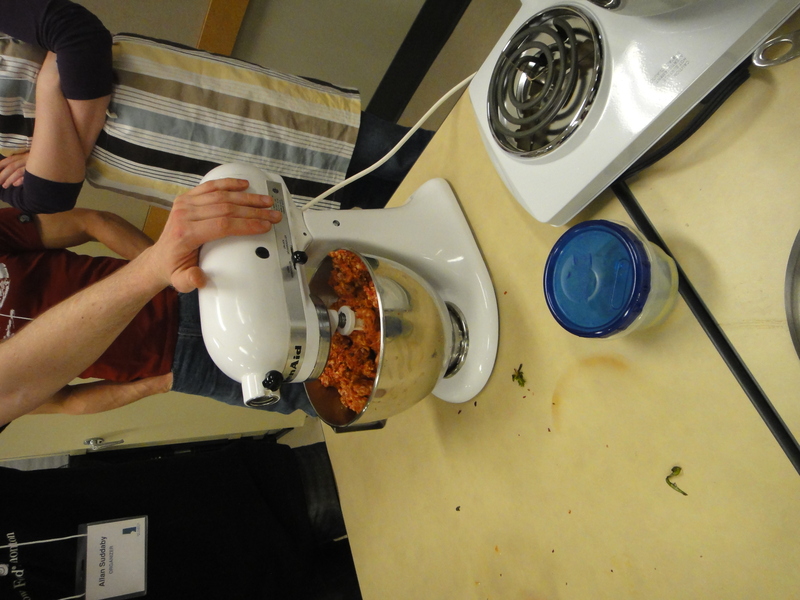 Allan Suddaby from Button Soup passed along his knowledge on how to make the perfect Spicy Italian and Kubasa sausages. 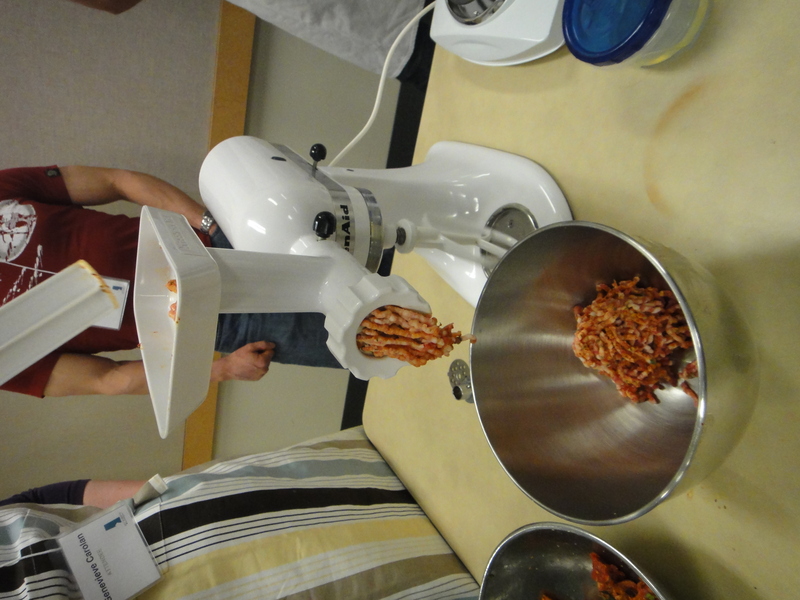 Being on the Italian Sausage side of the room, I hand-mixed in all the spicy goodness into the pork meat, before we added it into the grinder. 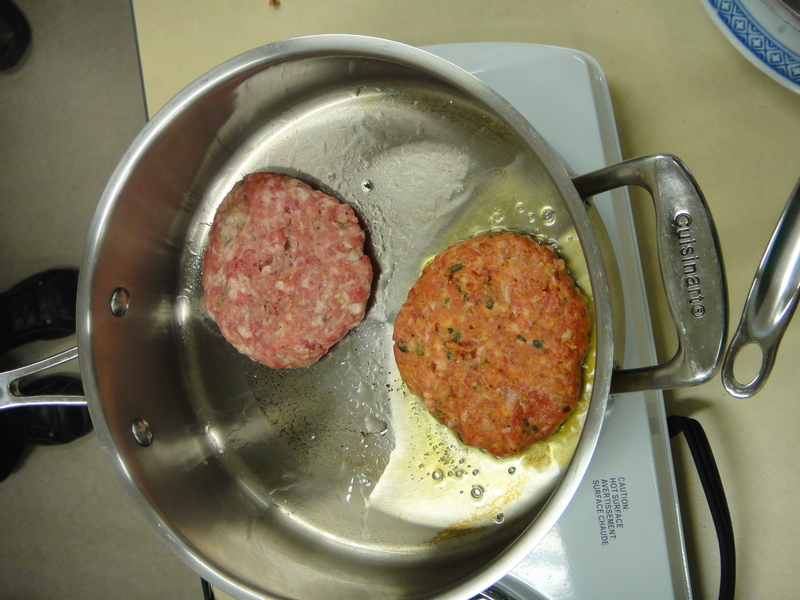 Can you see the marbling of the ground meat as it comes out of the machine? That’s because sausage is half half meat and fat. That I did not know before taking this workshop. It was very interesting, but also kinda gross! 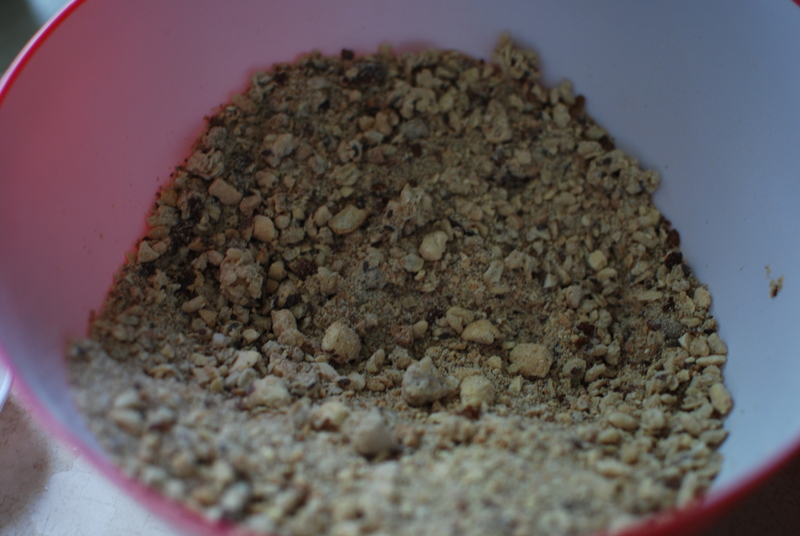 Once all the meat was ground, it was time to ferment it, using a little vinegar and salt. I didn’t know sausage was fermented!! Allan then told us the next most important step was to taste it, to see if your spices were right. He fried some of each sausage up, so that we could have a taste. These were really really good!! The next step in sausage making was probably the most gory (I’m warning the squeamish, you may want to skip ahead a few pictures if you don’t have a strong stomach. 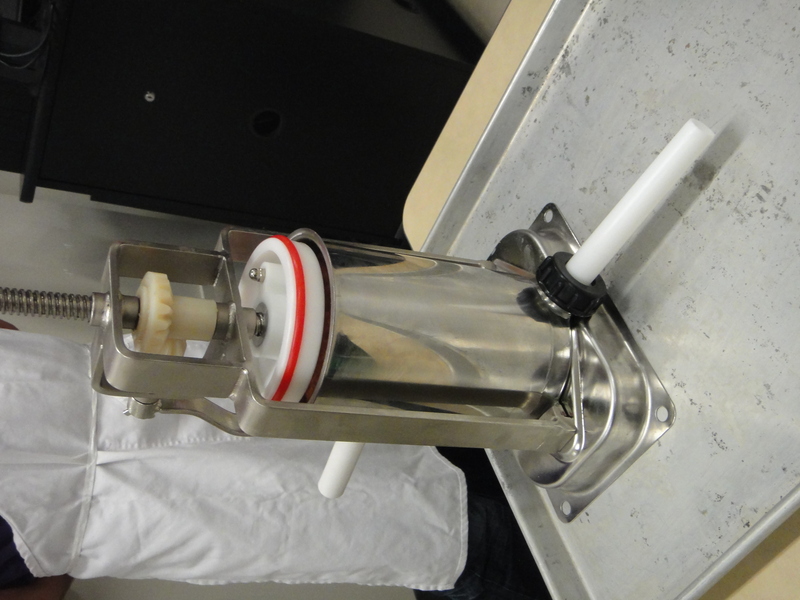 It was almost too much for me…) This is the sausage stuffer. Pretty innocent looking machine eh? This however, is not to innocent. 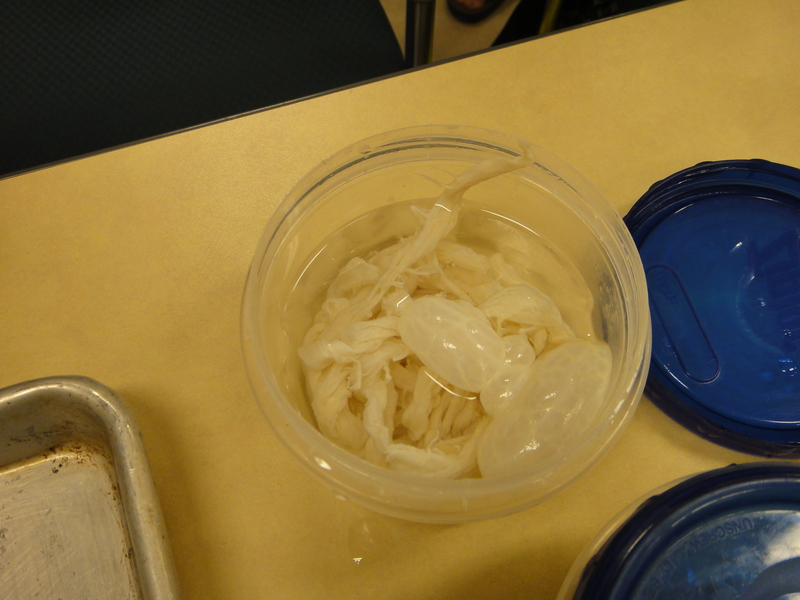 It’s a nicely washed and preserved small pig intestine. Yummy. 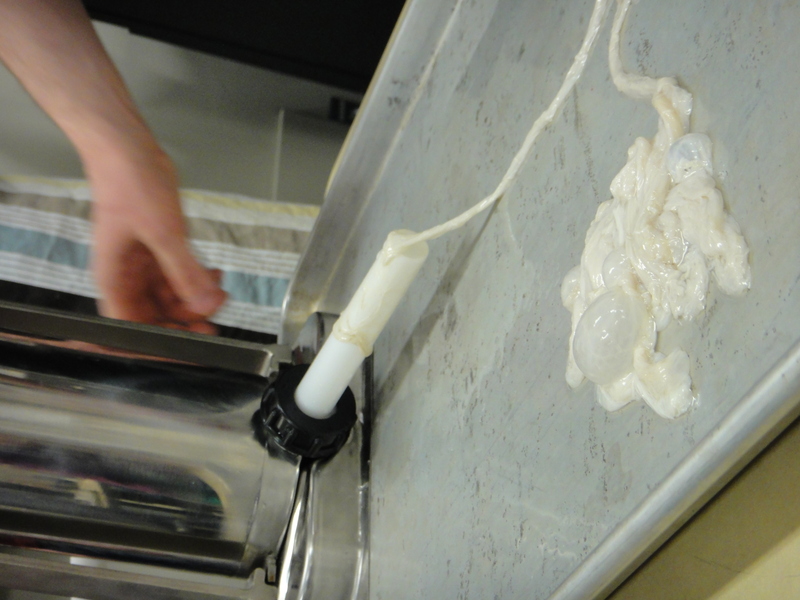 Then the meat was literally pressure pressed into the intestine tube. We didn’t section it off as we went, rather we kept one long tube until the end. 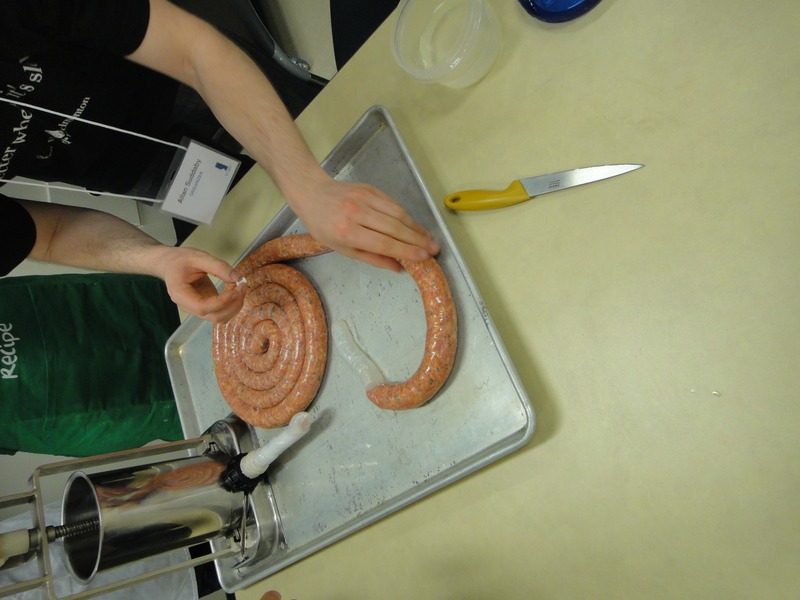 To section it off, Allan showed us that we needed to twist every second sausage in the opposite direction, so keep it from falling apart while drying. Be proud of me! 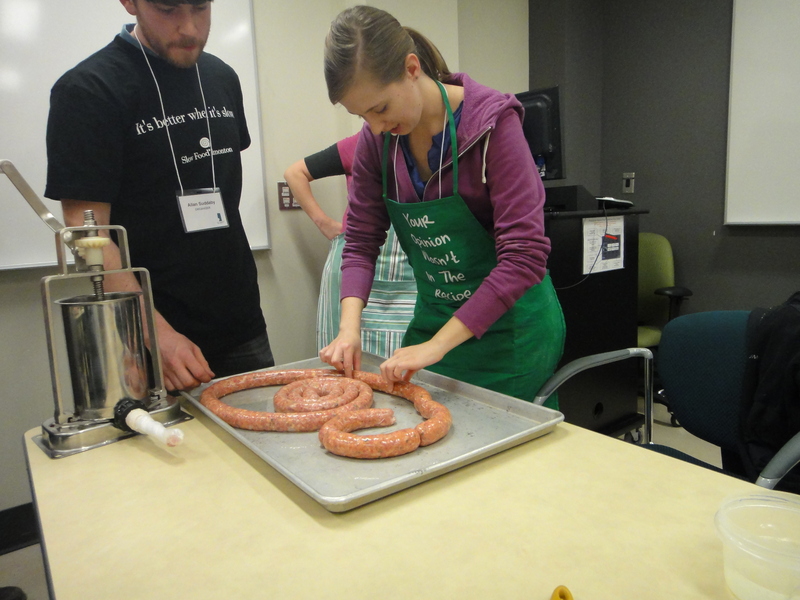 I got over my meat touching aversion to learn how to section off sausages! 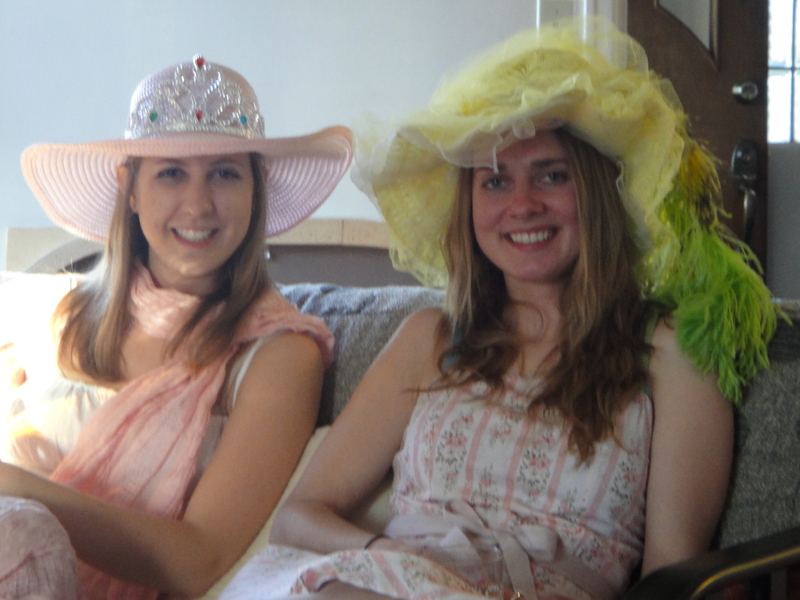 So did bride to be Michou! 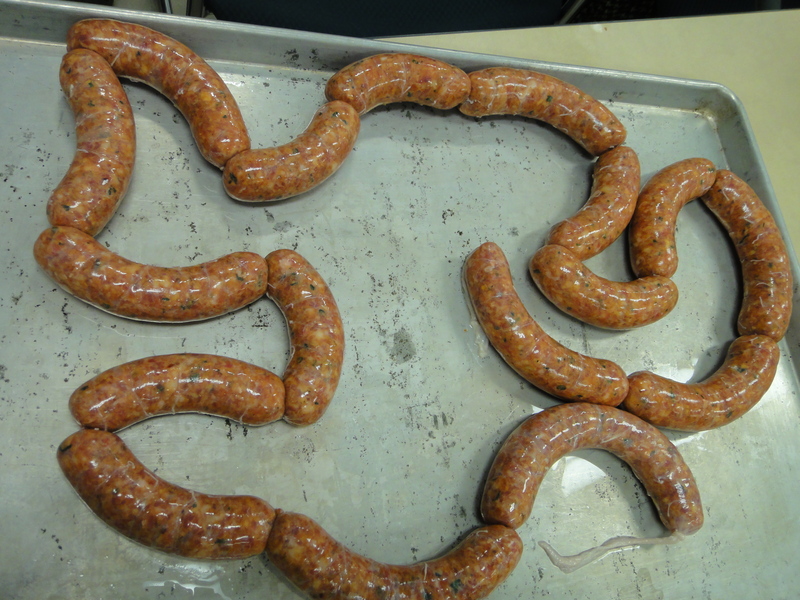 The end result of our sausage making extravaganza! Kevin Kossowan delivered the afternoon keynote. It was so interesting and rounded off the full way so nicely!! 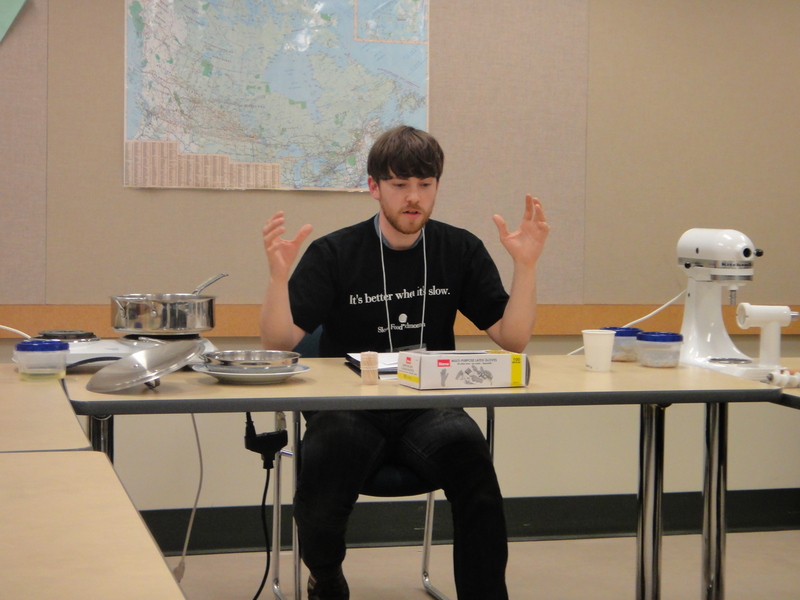 He talked about the challenges to the growth of the local food system in Alberta (such as long waiting lists at farmer’s markets, and silly provincial laws preventing farmer’s from selling ducks as agricultural products), and the plethora of options that you have to chose from when it comes to local food! I found Kevin’s talk to be quite inspiring. He really solidified for me all the reasons why I decided to go down the local path in the first place. Eat Alberta was a wonderful day filled with local foodie awesomeness. 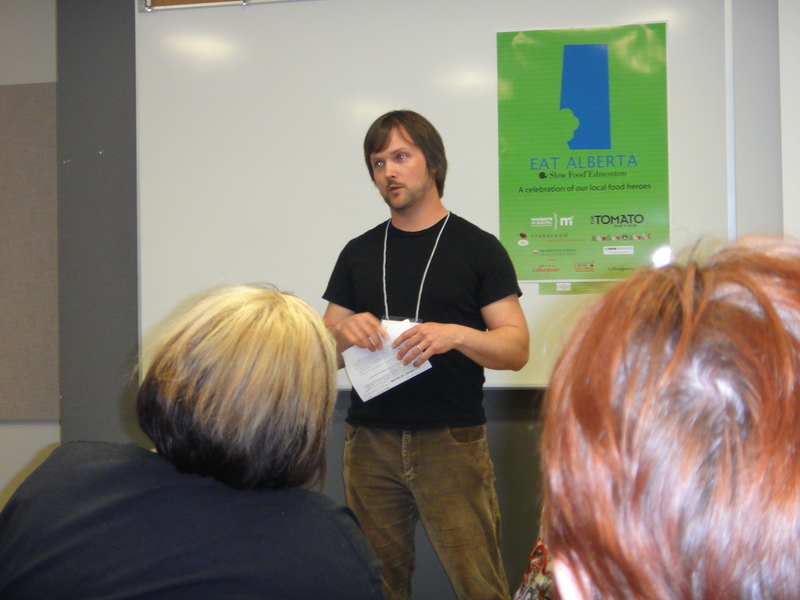 I really appreciated the huge amount of work slow food edmonton put into the day to make it a huge success! 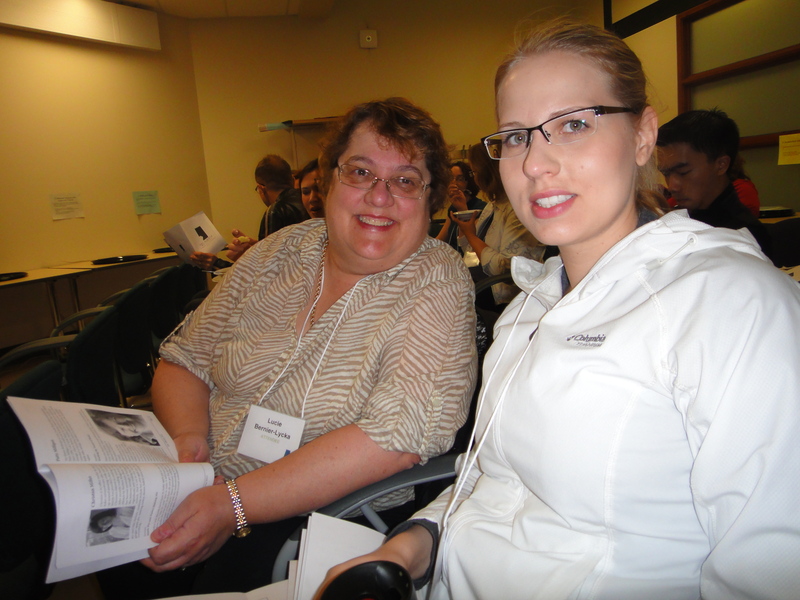 I’m already looking forward to next year’s conference!